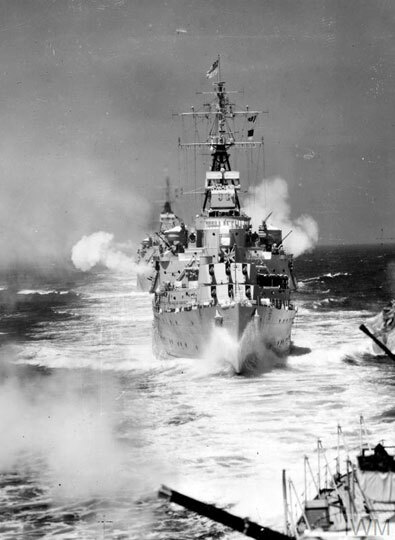 The 1952 to 1954 was an adventurous one for HMS Gambia. On June 15, 1953 she was present at the Coronation Fleet Review to celebrate the Coronation of Queen Elizabeth II at Spithead. 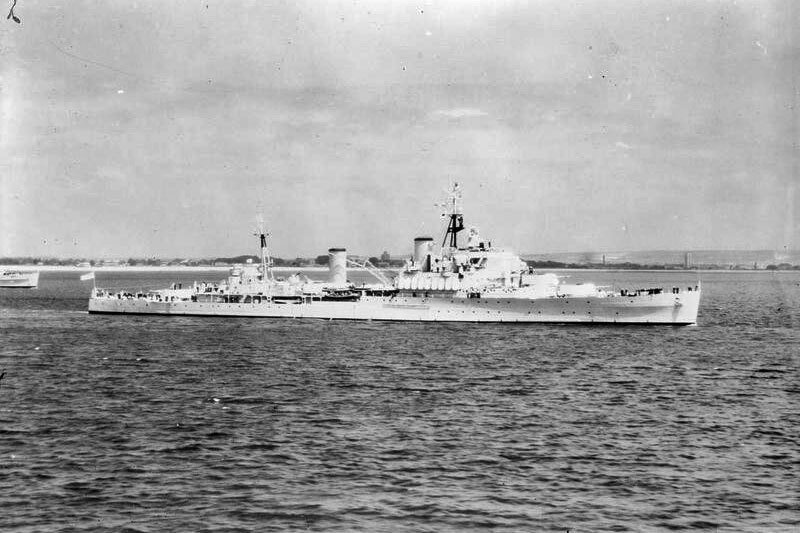 In August 1953, she and her sister ship HMS Bermuda brought aid to the Greek island of Zakynthos when it was struck by a severe earthquake. 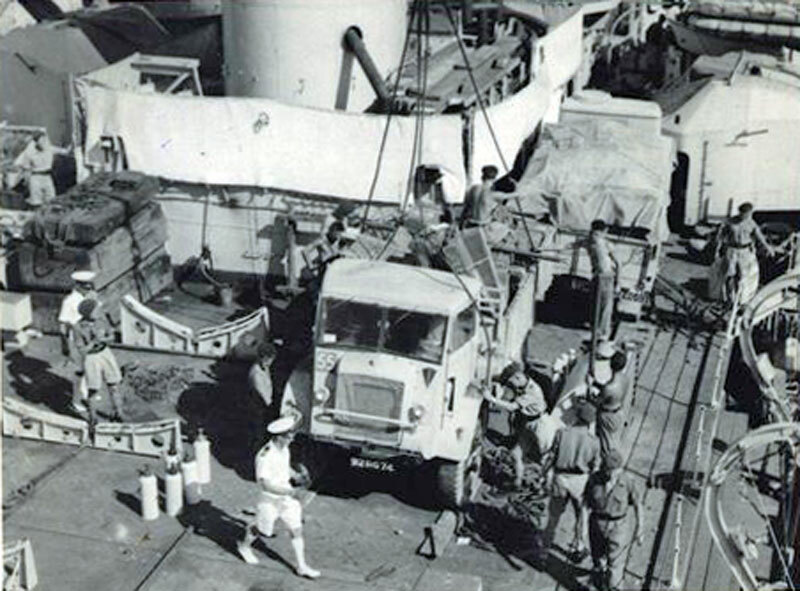 In August 1954, HMS Gambia evacuated 40th Brigade of the Royal Marine Commando from the Canal Zone. Dress: No 8's. Quarterdeck Staff No 2's (Negative Jerseys). Libertymen No 2's (Optional Jersyes). Canteen Libertymen Night Clothing. Leave: To the Starboard Watch from 1700 until 0700. Chief and Petty Officers from 1645 until 0730. Men U/A 2315. Boys 1900. Watchkeepers 0700 and 0900. Canteen Leave to the 1st Part of Port Watch from 1830 until 2230. Morning Watchmen scrub Quarterdeck and Bridges. 0610: Cooks to the Galley. 0620: Hands to Breakfast and clean into No 3's. 0715: Hands fall in. Prepare for entering Harbour. (One berthing wire for'd and aft to be provided). Rig Port After Ladder. 0830: Close all "X" and "Y" openings and doors and scuttles. Assume D.C. State 3. 0845: Clear Lower Deck. Hands fall in for Ceremonial Entering Harbour. Special Sea Dutymen to your Stations. 0900: Entering Harbour. Berth Boathouse Wharf. Starboard side to. Use Dockyard wires. 1030: Boat to Gozo Steps with Lt Cdr (L) and Cinema Films. 1130: Clear Lower Deck. 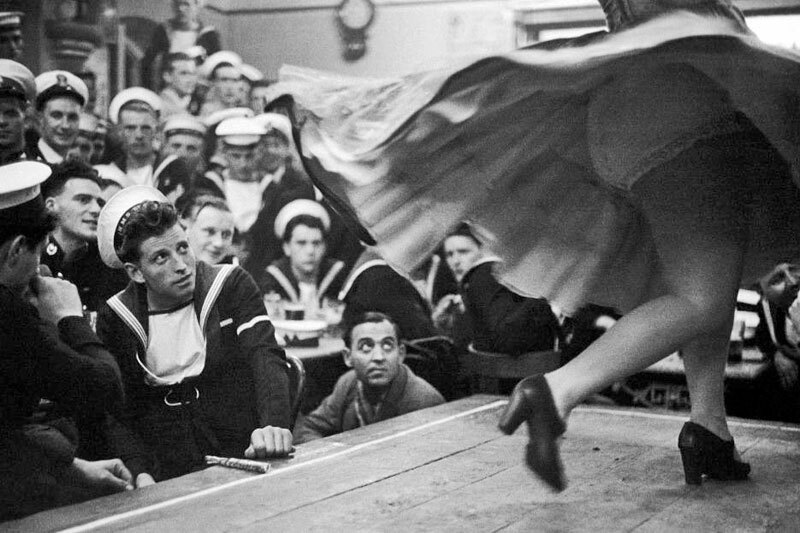 Hands fall in on Quarterdeck. The Admiral will address the ship's Company. Mon., Wed., and Friday 1600 - 1700. (1) 14 dys will be allowed for reading books, and after this time any books not returned will be assumed lost and a charge of 5/- for each book will be deducted from the ratings pay. (2) No rating is allowed to draw books in another ratings name. (3) Charges for the loss of Reference Books will vary according to the value of the book. Self Maintenance Period. The object of this period is to put right the things which we know to be wrong and which we cannot do while the ship is running and in routine. While we are doing this it is essential that the ship does not go back. At the same time we will cur daily chores to a minimum, and so brightwork having been thoroughly cleaned will be greased, wooden decks and ladders will be limed, etc. During this period we shall work a special routine which will be published today. Hands will not fall in until 0750 and tea will not be until 1630. Leave will be granted to Chief and Petty Officers from 1645 and to junior ratings from 1700. 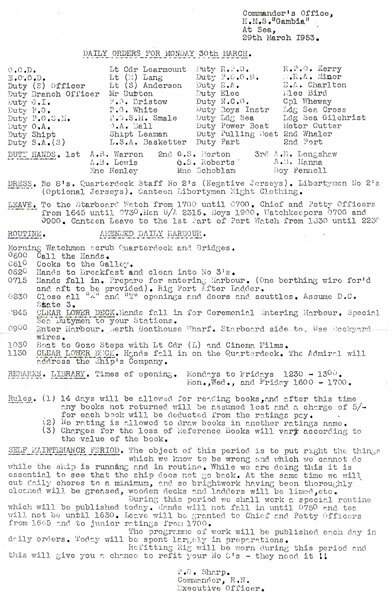 The programme of work will be published each day in daily orders. today will be spent largely in preparation. Refitting Rig will be worn during this process and this will give you a chance to refit your no 8's - they need it!! 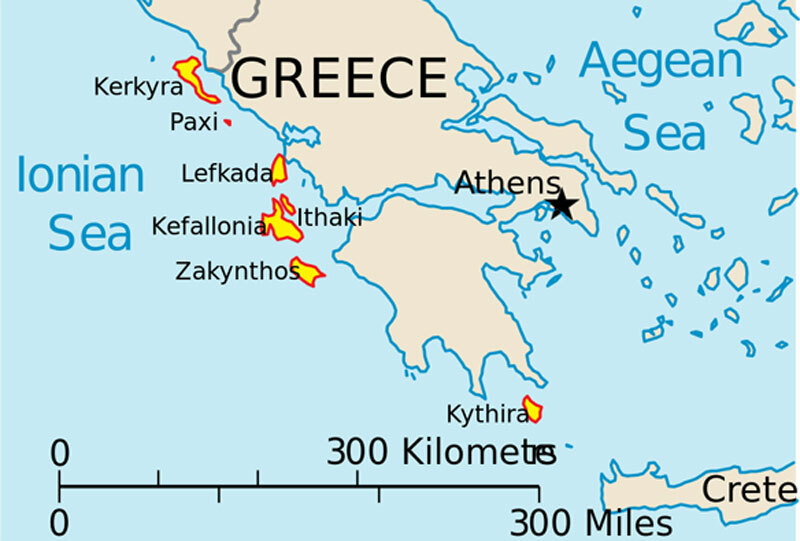 During August 1953, there were 113 earthquakes recorded around the southern Greek Ionian islands between Kefalonia and Zakynthos, the latter being known to the British as Zante. 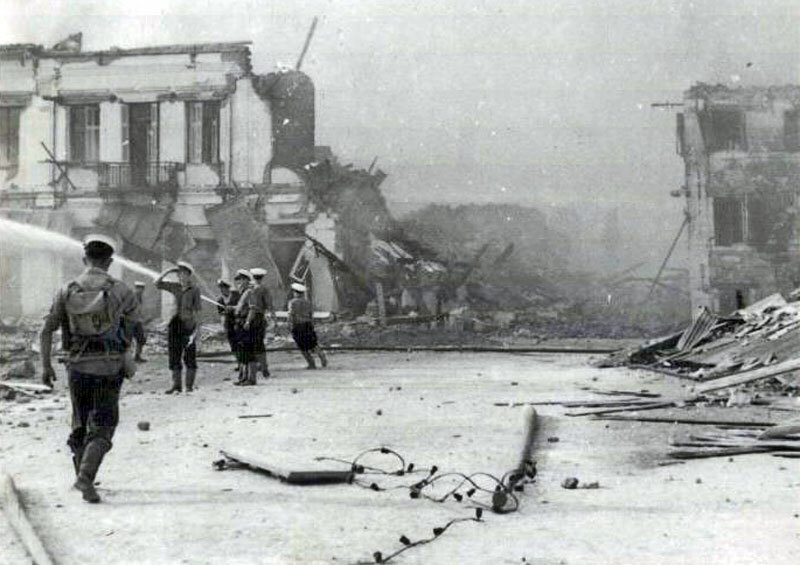 Four of the earthquakes were major and the one on August 12 was massive, recorded as 7.2 on the Richter scale. This earthquake very caused severe damage to the islands of Kefalonia and Zakynthos and raised the whole island of Kefalonia by 2 feet. 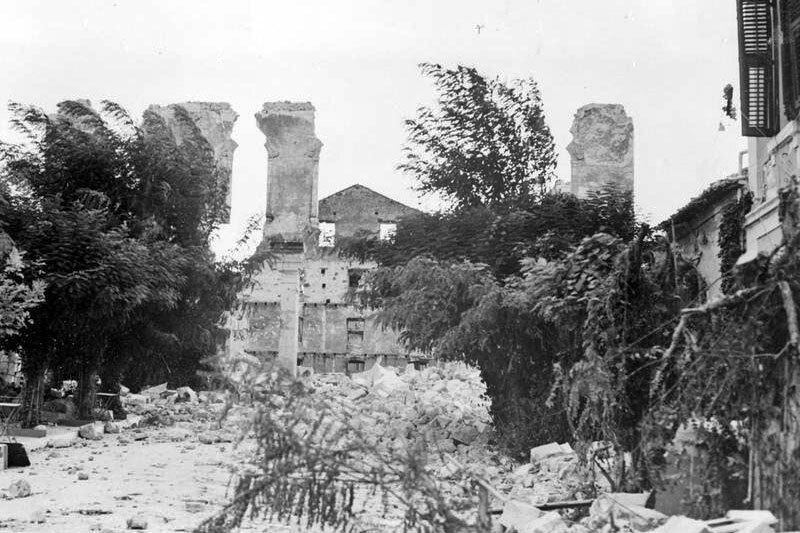 In Zakynthos, the capital of Zakynthos the island, only two buildings survived. 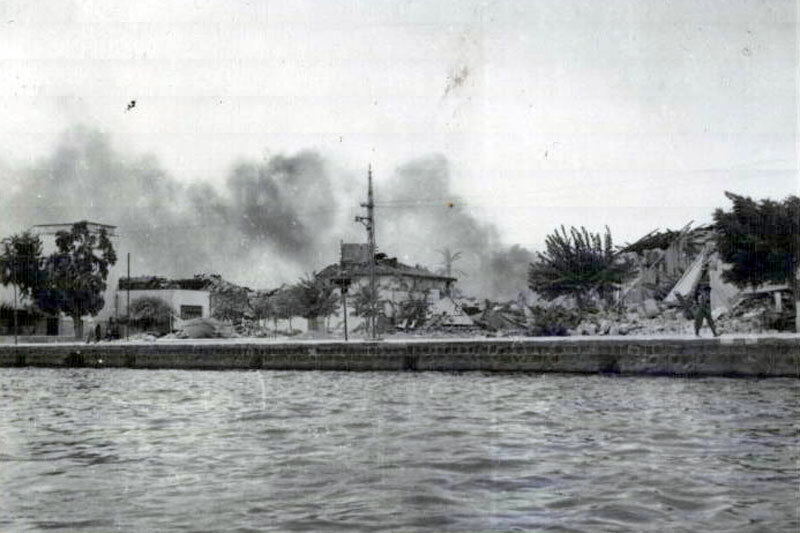 All the buildings in the south of Kefalonia were destroyed. 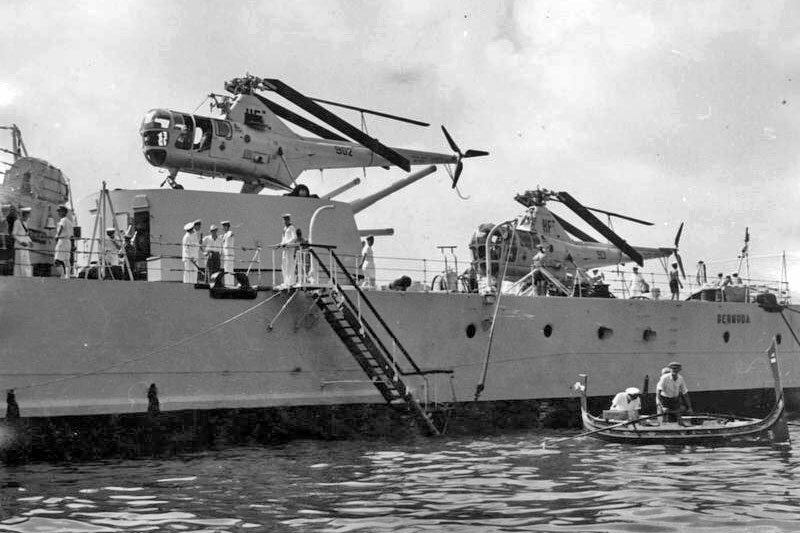 At 0612 on August 11, the tour of duty at the Canal Zone came to an end as the old lady weighed both anchors and slipped from the jetty, bound for Malta. With not a care in the world she was halfway home, strolling along at her usual leisurely pace when at 1930 on August 12 a signal brought sudden drama. Disaster had struck the Ionian Islands: an earthquake had ravaged Zante and Cephalonia and help was urgently needed. 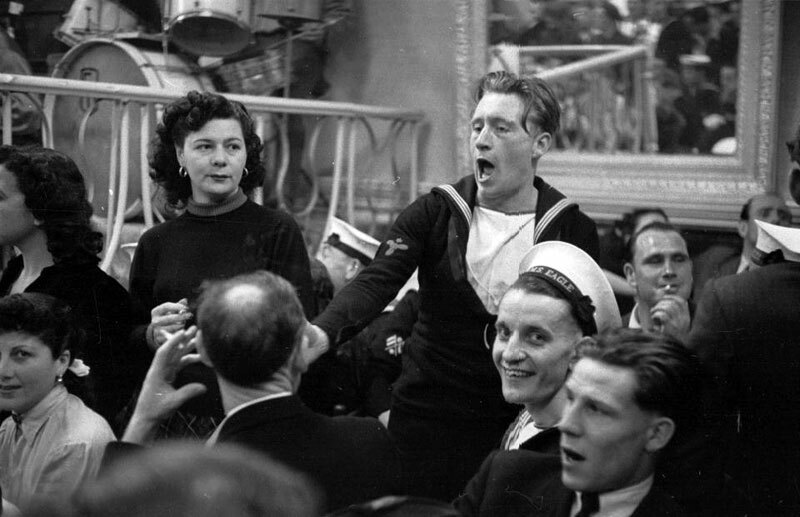 As the ship heeled over in answer to her helm and the engineers strove for more speed the news was broadcast over the warning telephone, H.M.S. Gambia had altered course for Zante. F R O M C - I N - C . M E D . T O G A M B I A - "Proceed at full speed to Argostoli in the Ionian Islands to arrive at first light - severe earthquakes have occurred." The epic of Zante was gradually unfolding its pages. The first paragraph was in print, the remainder had yet to be set on the presses in the chronicles of human suffering. 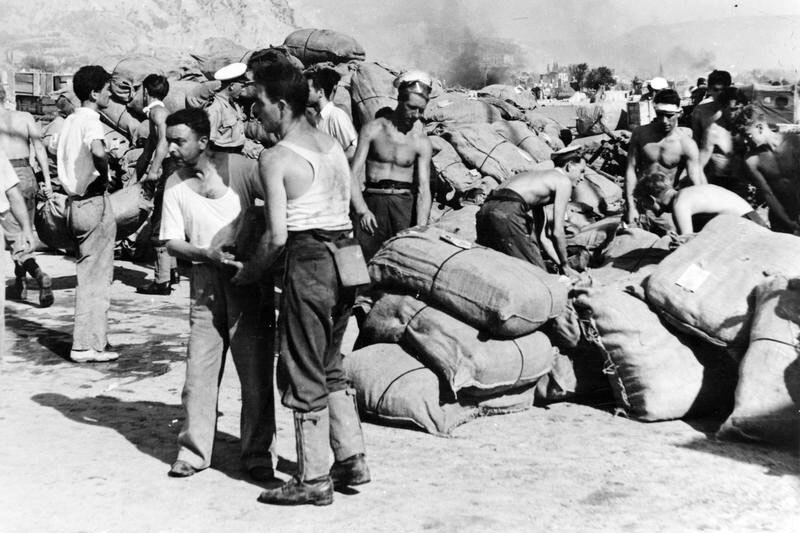 The rest of the night and early morning found us hastily preparing emergency stores, provisions and equipment for relief work and although we were low on supplies after our duties in the Suez Canal, most of the items required were produced. 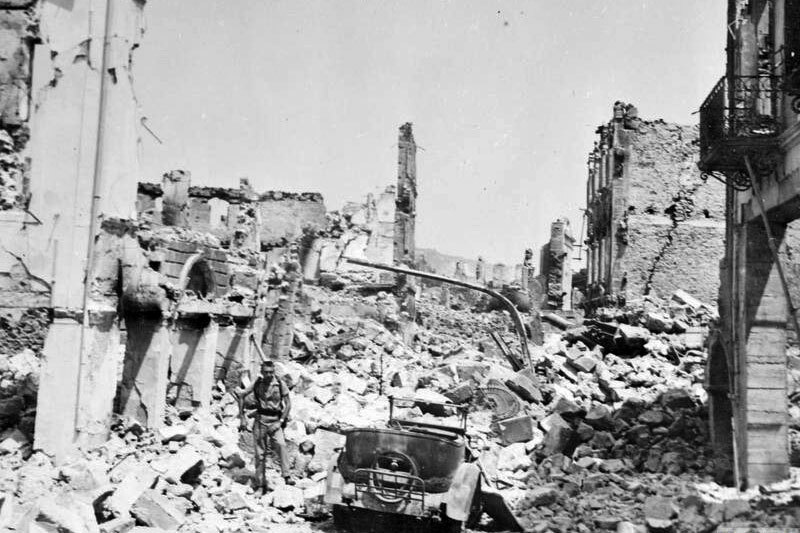 A further signal was received in the early hours of August 14 instructing us to proceed to the capital, Zakynthos, where the damage was believed to be the greatest. We sighted the island at 0700, the town itself hardly discernible through a thick haze of smoke which hung like a shroud over the still and silent town. 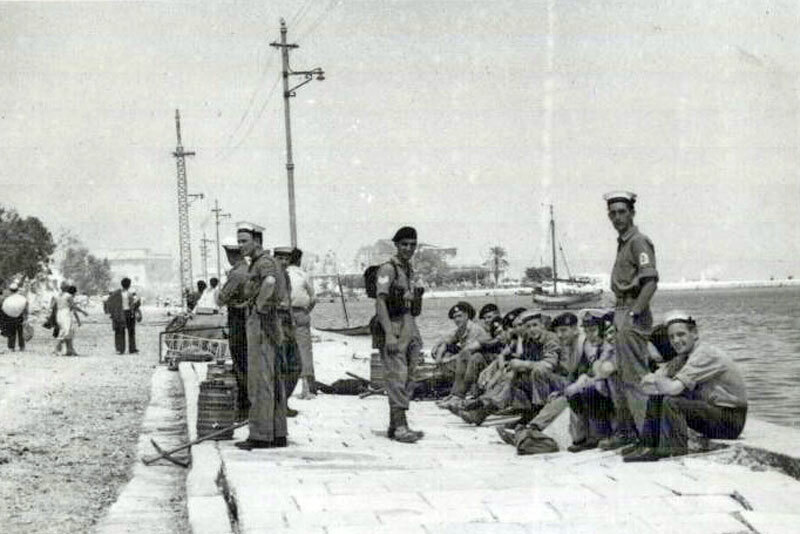 A Greek landing craft was already anchored in the bay and the Captain was soon making contact with their personnel in an effort to discover the full amount of damage which the quake had wrought. 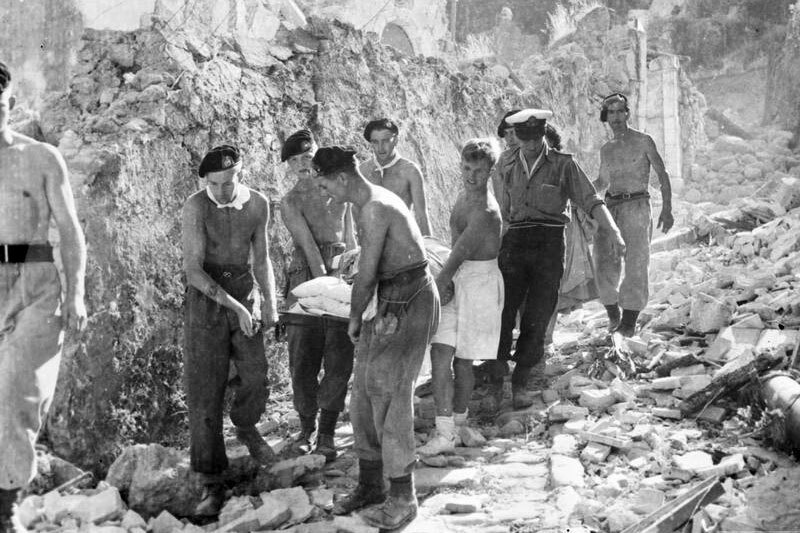 At 0800 the Royal Marine Battalion and two platoons of seamen and stokers were landed with demolition charges, shovels, and picks with the object of clearing a road through the town to enable casualties and supplies to be moved. The work of all parties was made extremely dangerous by the presence of hand grenades which were stored in practically every house and used by the local fishermen to stun fish; these were exploded continually under the heat of the blaze. 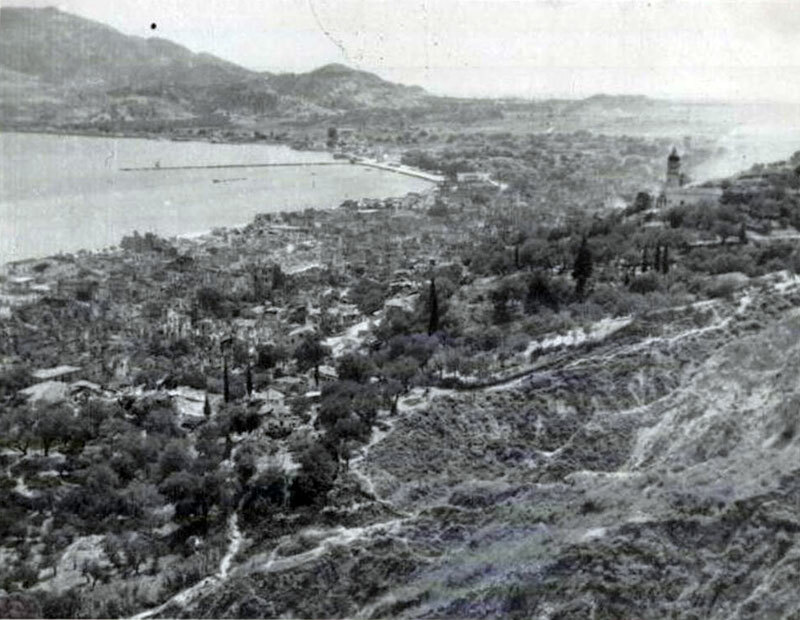 The town itself was found to be divided into three separate sections completely cut off from each other by masses of rubble and fallen masonry and the only possible means of reaching each section was by boat. Zante had been on fire since the earthquake first struck and was still a blazing mass when we arrived. From time to time frequent earth tremors still shook the ground and could even be felt on board ship as if depth charges were being exploded in the sea. 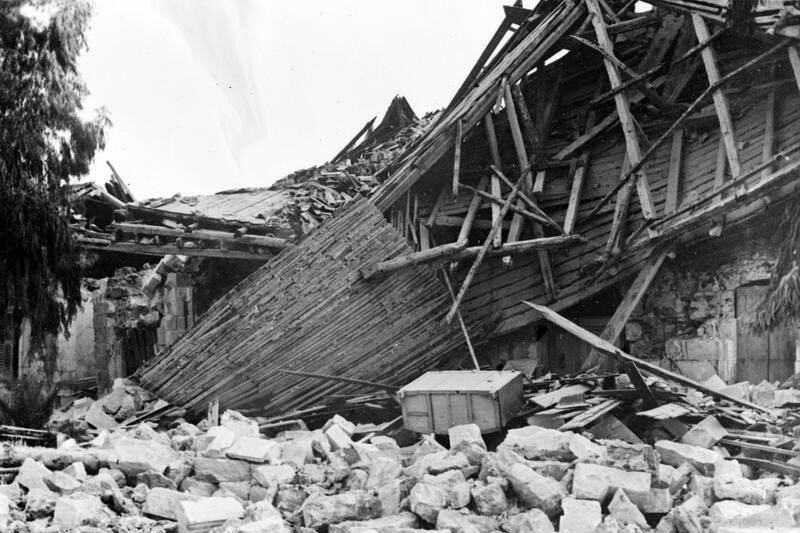 Each tremor brought fresh destruction to this stricken area, piling debris upon debris until most of the narrow streets were buried to the height of ten feet with fallen bricks and shattered timber. The only buildings to survive the devastation were the school, the bank, and one of the churches which had only recently been completed. 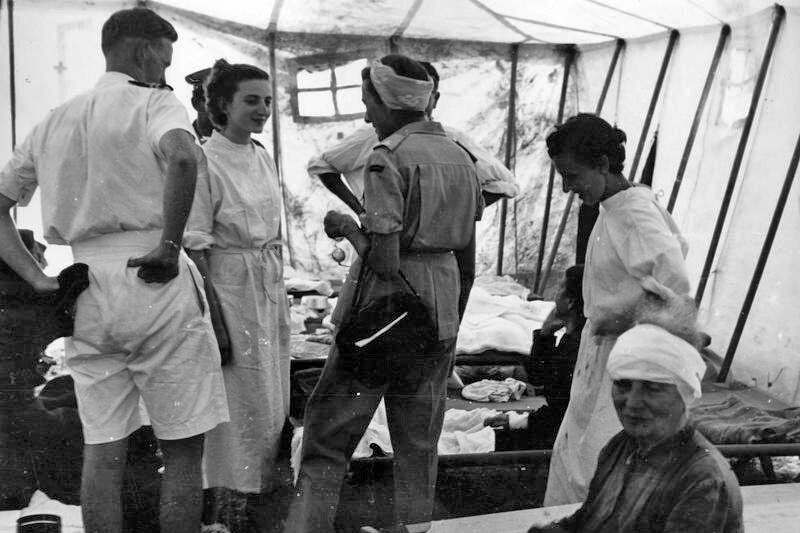 These were taken over as casualty clearing stations and manned by a team of doctors and nurses who had been rushed across from the mainland. The more serious cases were dealt with on board the L.C.T. which had better facilities to deal with them. 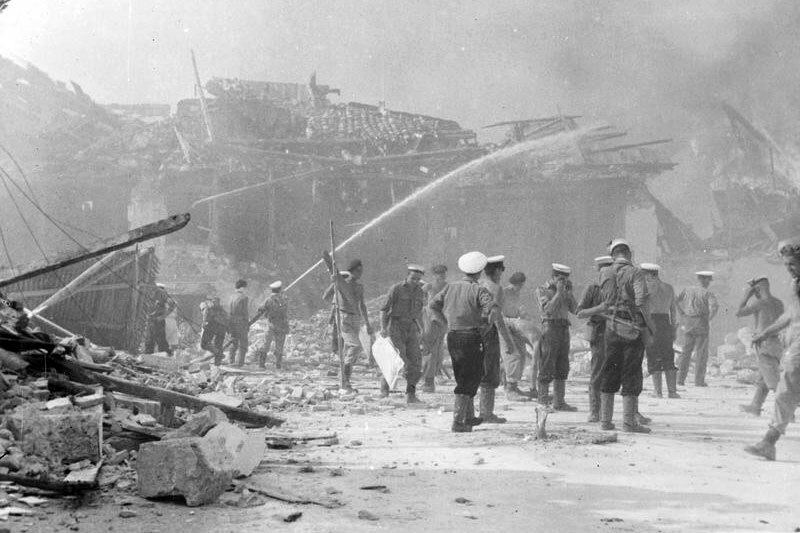 The main task of the ship's firefighting squads was to prevent the fire from reaching and destroying the hospital, and as there were no appliances immediately available to fight the fire in the normal way, a fire ditch had to be cleared by means of blasting away the ruined buildings in the immediate vicinity. 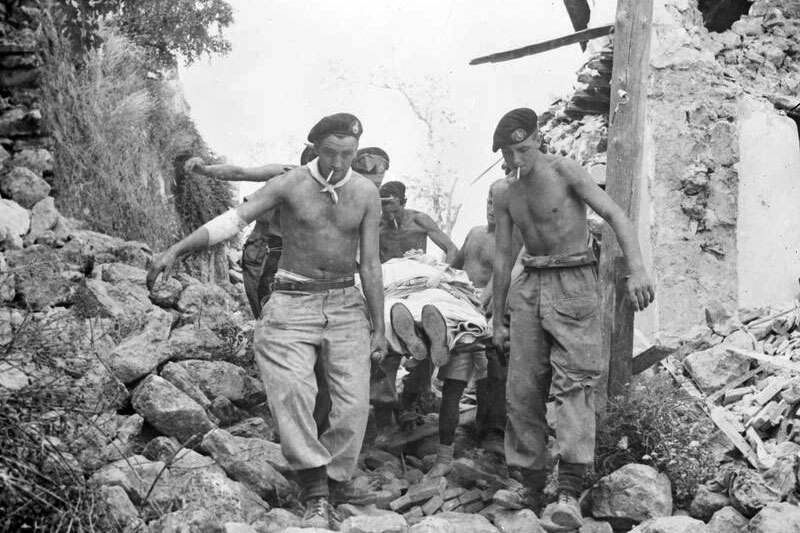 By late afternoon the Royal Marines had succeeded in cutting and blasting a road through to the south of the town and casualties were hastily transported by our first-aid teams to the temporary hospital for treatment. 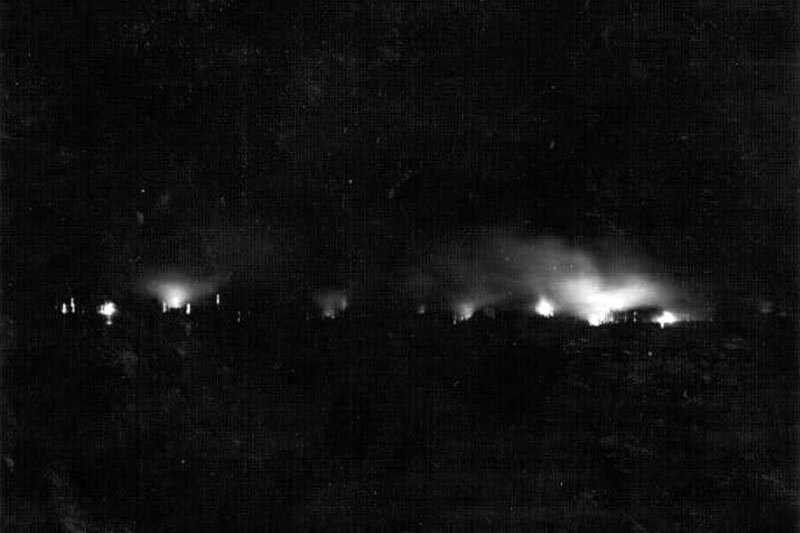 As night set in the sky was lit up by the flames which were still relentlessly eating their way through the town but the work went on unceasingly. Most of the ship's company had been ashore for the better part of the day and night, returning on board for a few hours' sleep before continuing the battle against nature's fury. The majority of the inhabitants had eaten no food for the past three days, neither had they been able to obtain any water and were in a pitiable condition. To ease the situation the bakery worked all hours turning out hundreds of loaves. Milk and every variety of tinned foods were sent ashore as well as water either in barricoes [small barrels], or when the situation became acute, by filling up the whalers and towing them ashore. The distribution of food, to ensure that every possible person was catered for, became as arduous a task as firefighting. Most of the ratings ashore gave up their bag meals rather than watch the expression on the faces of the island folk as they ate. Many a hardened salt was pressed into service as a nursemaid, tenderly holding a baby whilst trying to feed it from a tin of Ideal milk. At 0800 on Friday, August 14, Earl Mountbatten, accompanied by Lady Mountbatten and staff officers, arrived in the bay in a R.A.F. Sunderland to view the damage and coordinate rescue work with the local Greek authorities. 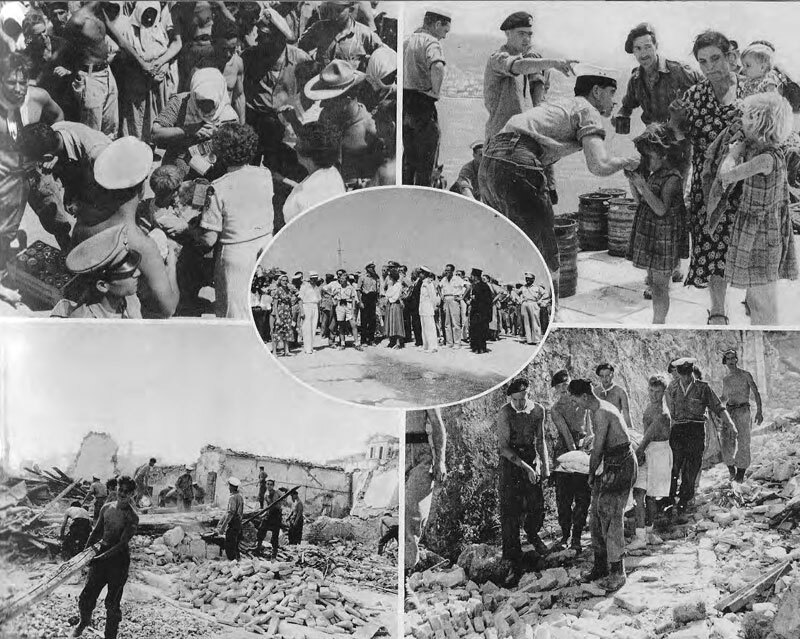 During all this time, Dakotas of the Greek Air Force were circling the town dropping food, medical supplies, and bundles of clothing to the survivors who were grouped around the outskirts of the town. 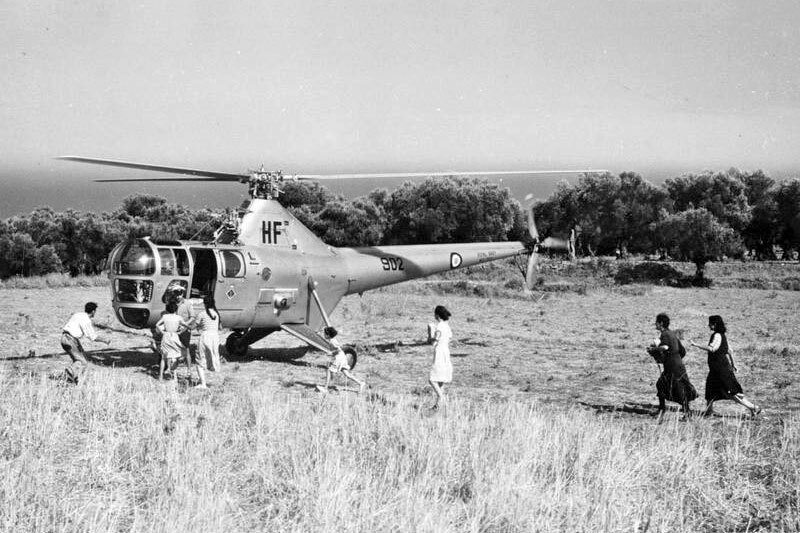 Helicopters were landing on open spaces as well and taking the more seriously wounded back to the mainland. By the time darkness fell a further road had been cut through. 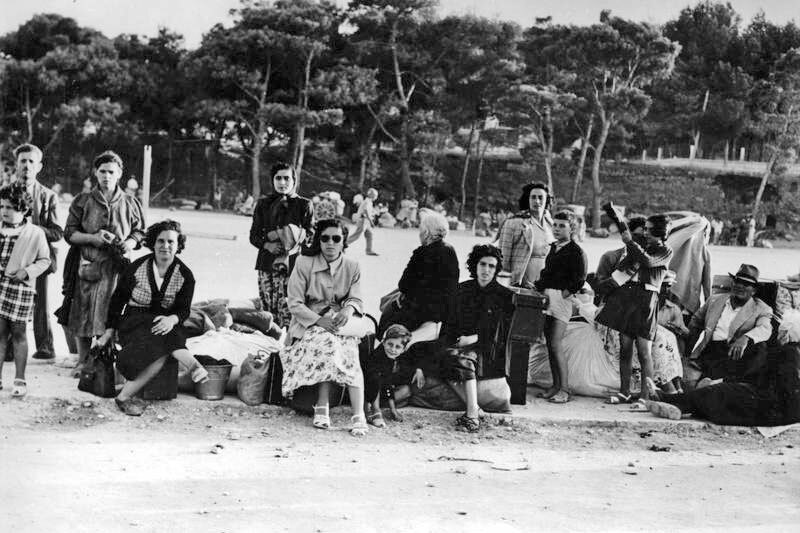 The town and the majority of the survivors had been formed into two large camps, one at each end of the town. This enabled us to carry out a rough census and also facilitated feeding arrangements. 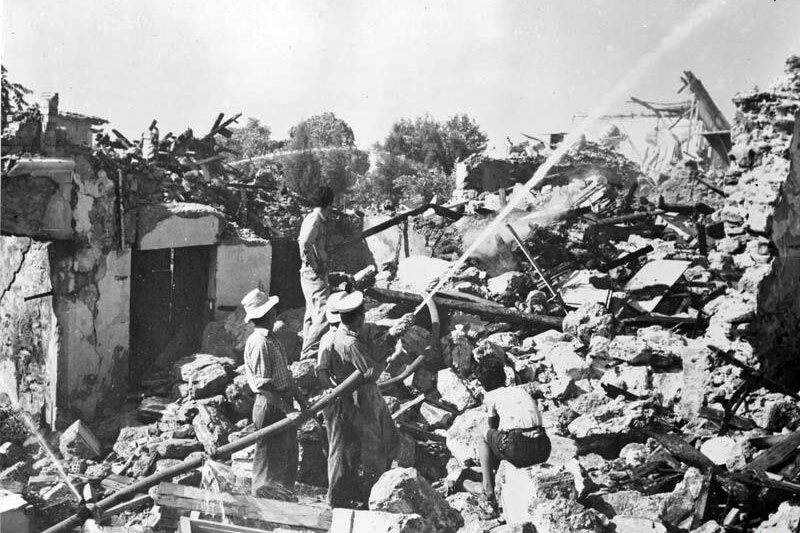 During the day two portable diesel pumps had been landed together with a considerable number of fire hoses which made the work of the fire parties much easier and soon most of the major fires were under control. On Saturday, August 15, an American landing craft and our sister ship, H.M.S. Bermuda arrived from Malta loaded up with jeeps, two helicopters, and a large amount of much-needed medical supplies and food. To us on the Gambia she was indeed a welcome sight as we had been coping with the aftermath of the disaster almost entirely on our own over the previous two days. The remainder of the day was spent in turning the job over to Bermuda and landing the fresh equipment and stores. Amongst the new arrivals were many bell tents which were soon erected to form small villages to house the homeless population of Zante. Even more welcome were the large field kitchens so sorely needed to cope with the feeding arrangements. 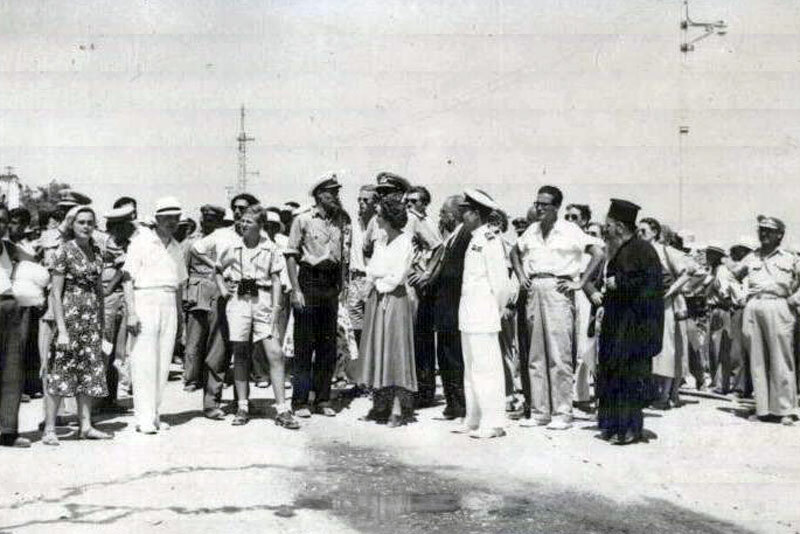 Early on Sunday, August 16, we began to withdraw most of our equipment and rescue squads from the area and soon a long procession of begrimed and exhausted sailors was coming back on board. 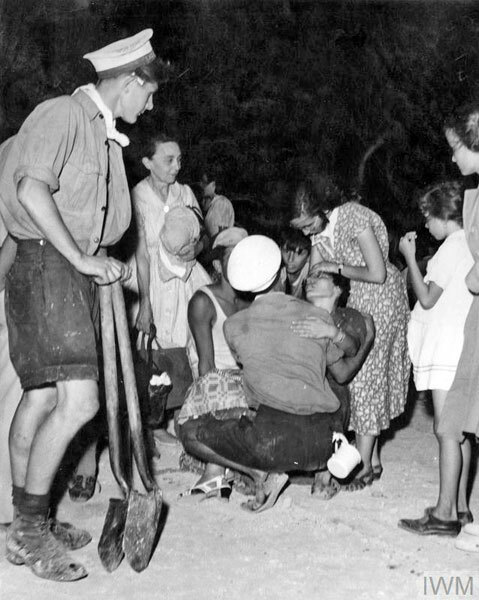 Most of them were asleep on their feet having preferred to carry on the rescue work throughout the night rather than take the well-earned rest which they so badly needed. Now others had taken up the task which we had started and our job for the present was completed. "Having just come back from Zante and having worked side by side with the C.O. and Ship's Company of H.M.S. Gambia I would like to commend them for their gallantry and services rendered beyond the call of duty. 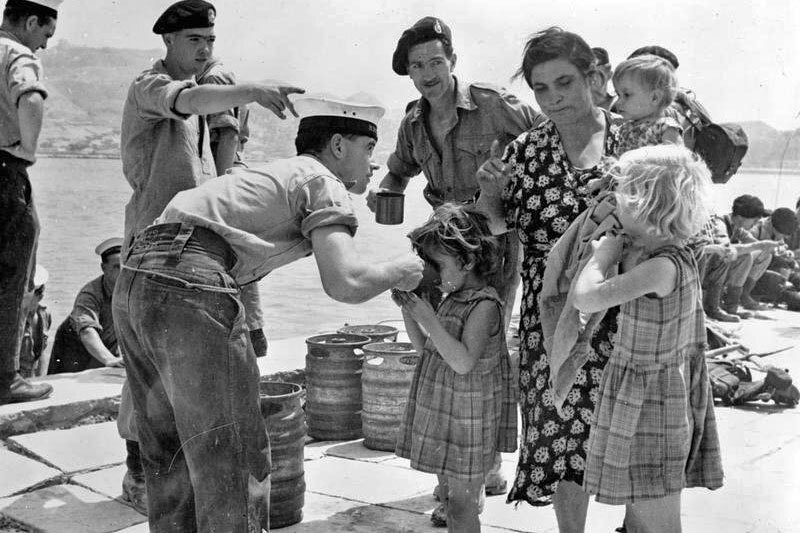 We Greeks have a long-standing tradition with the Royal Navy and it lived up to every expectation in its infallible tradition of always being the first to help. The high degree of discipline and training of H.M.S. Gambia's complement produced magnificent results felt all through the island of Zante. May I also convey to you as the Head of Her Britannic Majesty's Naval Mission here our heartfelt gratitude." And as we sailed from Zante the following message received from the Greek destroyer anchored in the bay warmed our hearts "May God bless you and your gallant ship." 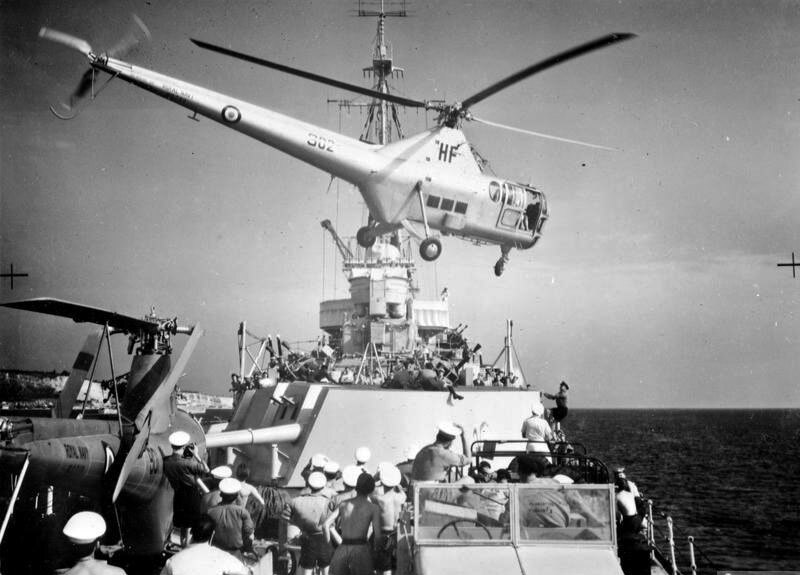 The British Royal Navy were the first to arrive to help with the relief effort, but ships from the United States, Swedish, French, Norwegian and Israeli navies all arrived. As a Marine Commando (45) I didn't actually serve on Gambia but was travelling on her from Suez to Malta on completion of my military service. This was in August 1953, when she was directed to make max speed to Zante the Greek Island that had experienced a devastating earthquake. This has become part of Gambia's history, I was on the first ships boat sent ashore when we arrived. This was far from being a pleasure trip or pleasant experience. When on Gambia I met a school friend Derek Funnel who was serving on her at the time (just one of life's little coincidences). Arriving in the bay and seeing Zante covered in flame and smoke should have forewarned us of things to come. A most unpleasant scene unfolded when we got ashore. I have not been to Zante since that day over 64 years ago, but the memory of what I was to witness that day is as clear now as it was then. A road runs right round the bay and another road ran inland, it was a job to navigate or identify the road running inland as the buildings were all burning and destroyed and that had to be blasted through. Coupled with this we would hear the explosions of grenades exploding deep within the burning buildings. And then a massive aftershock sent us running for the openness of the bay. I must now retrace my steps to when we first arrived on the Island. As we left the jetty there was a couple of large corrugated tins in the road and when I lifted them up there were two badly burned bodies, so badly burned were they that it wasn't possible to identify if they were male or female. All you could say that it was an adult and a half grown child. Some distance along the bay road a child was born and mother and child were place on a car trailer on a bed of tree branches and driven away. Some 60 years later when contacted by Roz Mills I told her of this and ask if she could find if the baby survived and she didn't bother to find out. You would think with her contacts in the council it would be easy to find out about a baby born in the road the day after the biggest earthquake in the islands history would be easily traceable. he rest of day one was searching in collapsed buildings for survivors, which was hazardous work. Having had the briefest of sleeps on board Gambia it was back to the island for more of the same as the previous day, we felt very guilty about going back on board to kip but my memory is one of tremendous fatigue. The only difference on day two, was when we landed on the jetty there was a group of American military on there.with the required iced drink machines etc. They were there in the morning when we arrived and still there when we returned later that night. Their day must have been a busy one, telling the adoring press what a great job they were doing. I can honestly say hand on heart I never saw any other nationality involved in the work we were doing apart from the sailors and Marines from Gambia and Bermuda for the three days we were on the Island. One nice recollection was how quick the Gambia's small shop ran out of sweets and chocolate bars, as all the guys were buying them to take ashore to give to the kid,. and where the official report says that Lord Mountbatten arrived to coordinate the rescue effort, I think this demeans the ability of the two Captains who organised the whole thing and this was without doubt a Royal Navy operation from start to finish. My opinion is that Lord Mountbatten and his wife were there for a photo opportunity as always but anyhow he and his good lady must have arrived after we left as I never saw them but then as a lowly Marine he wouldn't have looked me up as our ranks were somewhat different. Day three started as did the previous two days with being out ashore early in the morning by ships boat to pic up where we left off the day before. I'm not sure exactly when Bermuda arrived, but a lot of tents mysteriously appeared and we spent the rest of our time creating a tented village for the locals. Whilst doing this King Constantine and his wife the queen arrived and shook our hands and thanked us personally. Although this was nice, the real gratitude came from the islanders themselves, who having lost everything, went into the fields and cut melons to bring to us as the work we was doing was very hot. I commend the men of HMS Gambia of which my mate and I stand along side although not listed as ship's crew are both proud to have been part of the work done by all of them. I am happy to have had the chance to be associated with such a great ship. 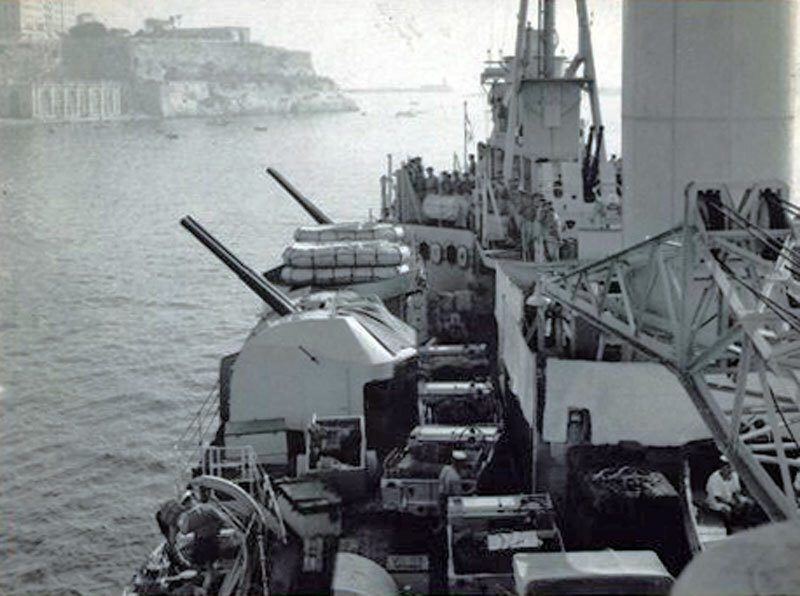 Following the arrival of Bermuda and with Gambia's supplies virtually exhausted, it was necessary for her to hand responsibility to her sister ship and continue her trip to Malta. I am not sure what time we left the island all I remember was the feeling of fatigue and tiredness we were all feeling , but to a man fatigue or not, all would have volunteered to have stayed as long as necessary to have finished the job. Not a man there wanted thanks or thought they were just following orders, they worked long arduous and often dangerous hours willingly to assist their fellow man. Myself and Albie said goodbye to Gambia when we arrived in Malta and were put into an army transit camp, ready to fly home and demob. Arriving three days later than expected we got our heads down and went fast asleep, at just after nine the following morning, the door burst open and an army sergeant major was balling and shouting, and calling us lazy bastards, and as it turned out we had not read the notice board which we should have done, and had been down for cookhouse duties for the past few days and our trip to Zante had got in the way. He ordered us outside in ten minutes and marched us before the CO an army Major. All he would say was that as we were flying home the following day he had no time to punish us both would send a report to the CO of Stonehouse Barracks in Plymouth where we were heading. We left Malta on an Elizabethan aircraft fly home. 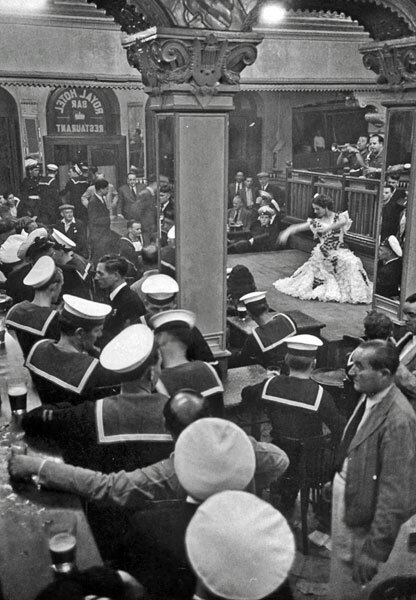 The plane developed engine problems on the way home and was diverted to Nice and we were put into the four star D'Albion in Nice for two days. What a contrast to the barracks in Malta. On arrival in Plymouth we were placed under arrest and taken before the CO who said he took a dim view of two Marines giving the army cause to criticize the regiment. He said he had the choice of extending our service by 6 weeks, but as I told him I had a job to go too he relented and said that our remaining military service would be under punishment was 10 days and as we were one weeks leave prior to completion of service in meant our final days stay in Stonehouse would be under punishment. I was told I must work in adjutants garden and must report to his wife in the officers' quarters at 8,30 the following morning. Knowing the Adj. was a miserable git of about 35 years old I expected the worst. But how wrong could I be. She was beautiful about 30ish and it was love at first sight, sadly it was from my part only and here I was a 21 year old Marine with hormones in overdrive, confronted with this lovely woman who treated me decently and kept an ever supply of tea and cakes going all day. It was a case of if this is punishment long may it last. It was customary at the time for Royal Marines travelling to far away places, to hitch a ride on any Royal Naval vessel going their way, and that was the reason my mate Albie Stringfellow and I were on Gambia, having completed our tour of duty with 45 commando we were travelling to Malta to fly home for demob. Gambia had on board an old three badger who had been a naughty boy and was in the cells and as they are able to unhook the chain from inside the cell for safety reasons while at sea. My duty was to stand guard outside the cell to prevent any escape. Where he could escape to I never quite understood, but our was not to reason why. Anyone knowing the type of ships Gambia was, will know two cells that are deep below decks in the bows of the ship and to be down there in rough weather when you are prone to seasickness is pure purgatory. It's like being continually lifted to the height a two story house and dropped, boy was I sick, so sick in fact, while I had my head in a bucket being sick, the prisoner let himself out of the cell and went walkabouts on deck came back checked that I was OK, locked himself back in the cell, and nobody was the wiser. The whole episode was pure "carry on" and the fact he did all this without being spotted prevented me being put in the cell next to him. I bet he had many a laugh at my expense later It took a few hours for Gambia to raise a head of steam to proceed to Zante and being relieved of guard duty I was able to go up on deck. Once Gambia got up to speed and charged straight through the waves instead of following them up and down, my sickness completely disappeared and at speed it was difficult to stand out on deck. 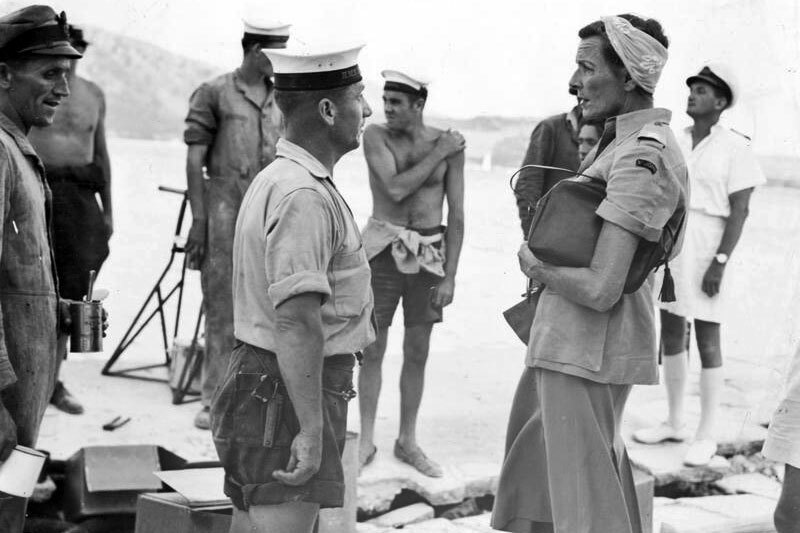 Royal Marines are all administered by the admiralty and only sea service Marines get a rum ration. 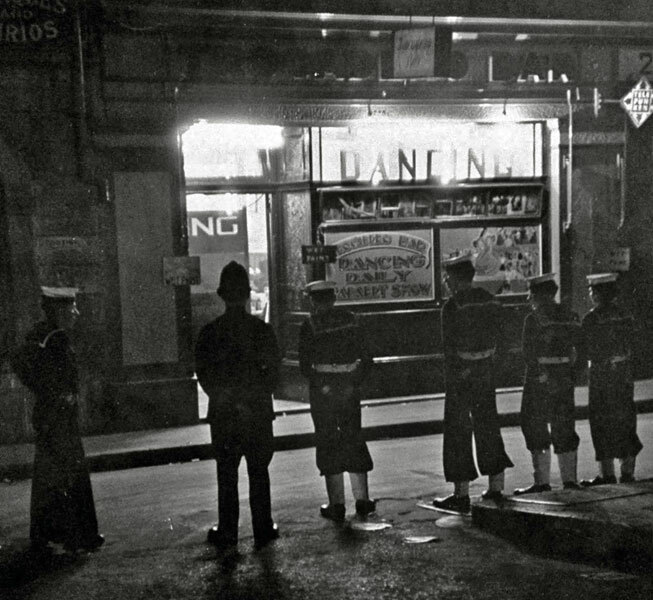 at the time of my service I was paid 3 pence a day in lieu of daily rum. Talk about coincidence, when I was first posted to Suez we were based in a large camp shared by the Green Howards, the RAF regiment and the Army Ordnance Corp. My first night in the joint NAAFI was a surprise when I joined the queue behind an army chap who when he turned round it was an old school friend called Peter Black. We shared a beer or five that evening. Unknown to Alan, his daughter Alison Anderson emailed me shortly after Alan started his emails. Alan felt that he and the other men of 45 Commando as well as some of the men of HMS Gambia did not get the recognition they deserved. 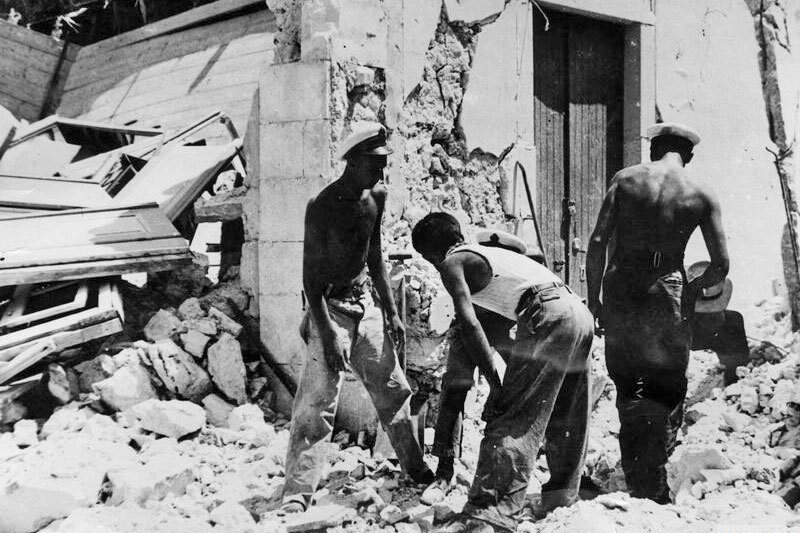 It appears that on the 50th anniversary of the earthquake, members of the HMS Gambia Association were not informed of the invitation to revisit Zante and take part in the memorial activities. On the 60th anniversary, Alan was contacted by a reporter from Zante and plans were made for him to visit the island, but then Alan did not hear anything else from the reporter. Your e-mail took me by surprise. I was really touched to know that some members of the crew are still alive. The Zakynthian people and I personally feel obliged to those people you came for our grandparents and parents rescue. I would like to express my gratitude to those people who helped us under such difficult circumstances. The words are not enough to tell them thank you. They are heroes to us and as heroes should be honored. Thus, I would like to invite them to Zakynthos on the following August when our Municipality will organize events for the anniversary of the earthquake and meet them and thank them. Mr. Thomas, do you think this would be possible? I know that August is 10 months ahead, but if we manage it would be the least we can do for them. Mr. Thomas, please give them my and all Zakynthians warmest regards. Tell them that they are our heroes and we would soon like to see them in Zakynthos. The surviving men are getting on a bit now, Alan is 84 (in 2017), and some of them are not in the best of health. But the work they did was and is still appreciated. As a young Marine I remember it well. 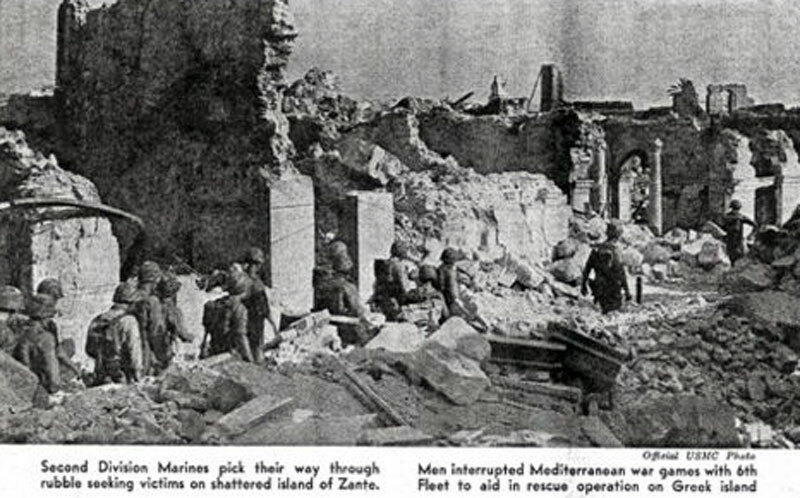 We were with the second battalion, Sixth Marines (Reinf) at Malta performing a NELM [Naval Forces, Eastern Atlantic and Mediterranean] Amphibious Operation when the order came through to proceed to Greece to aid the victims of the earthquake disaster, we sailed full speed for the Ionian Islands in the early hours of August 15, 1953 to the island of Zante. The village in complete destruction. In August 1953, while on patrol with the 6th Fleet in the Mediterranean Sea with a reinforced Marine Battalion on board the USS Rockbridge and the USS Monrovia. 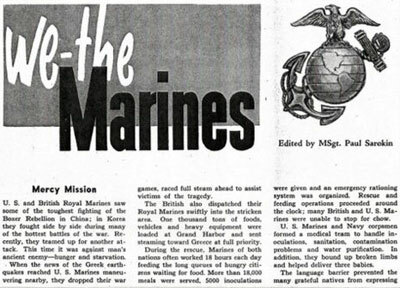 The 6th Marines where ordered to sail to the Greek Island of Zante for a humanitarian rescue mission. 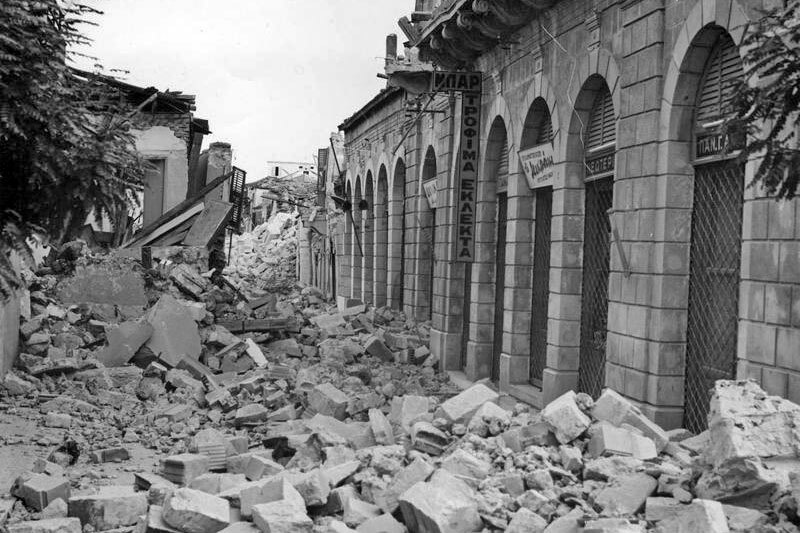 The Island had experienced a severe earthquake. 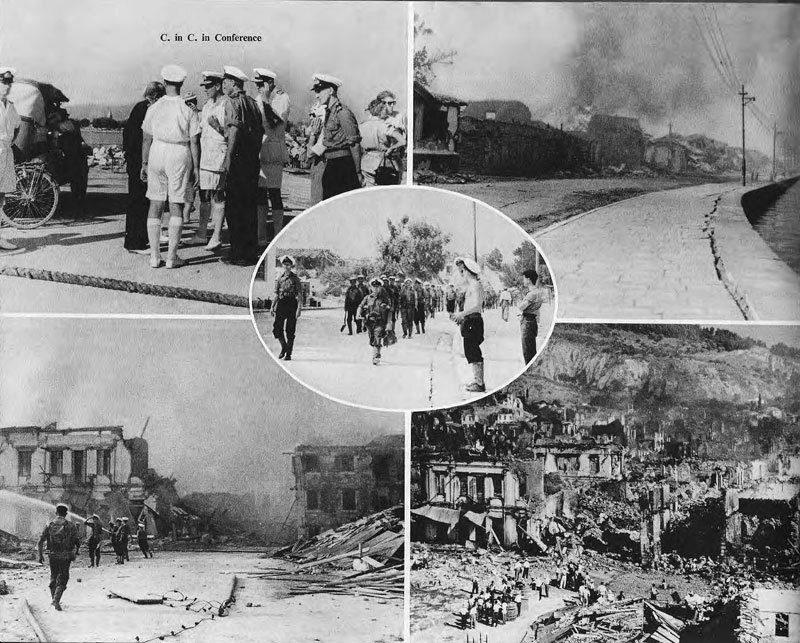 When Marines and Navy personal landed they found widespread destruction and loss of life. After administrating to the dead, injured and hungry the marines assisted in restoring power, repairing water mains,instituting sanitation measures, erecting temporary shelters and clearing roads. Only three building that I know of that remained standing, One bank and two churches. 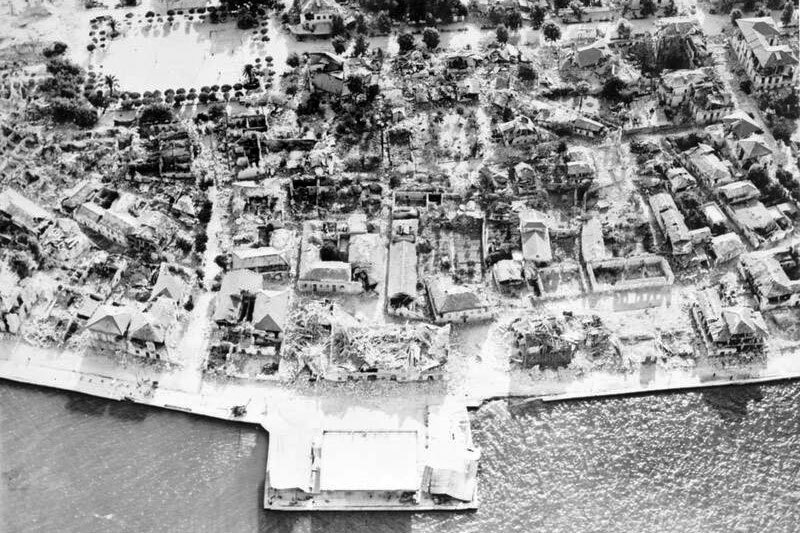 All other building on the Island was destroyed by the quake. Also involved with the rescue operations where the British Royal Marines and Naval Personal from the HMS Gambia. Not many are left to remember this Earthquake as we are in our 80s and most are no longer with us. U.S. and British Royal Marines saw some of the toughest fighting of the Boxer Rebellion in China; in Korea they fought side by side during many of the hottest battles of the war. Recently, they teamed up for another attack. This time it was against man's ancient enemy – hunger and starvation. When news of the Greek earthquake reached U.S. Marines maneuvering nearby, they dropped their war games, raced full steam ahead to assist victims of the tragedy. 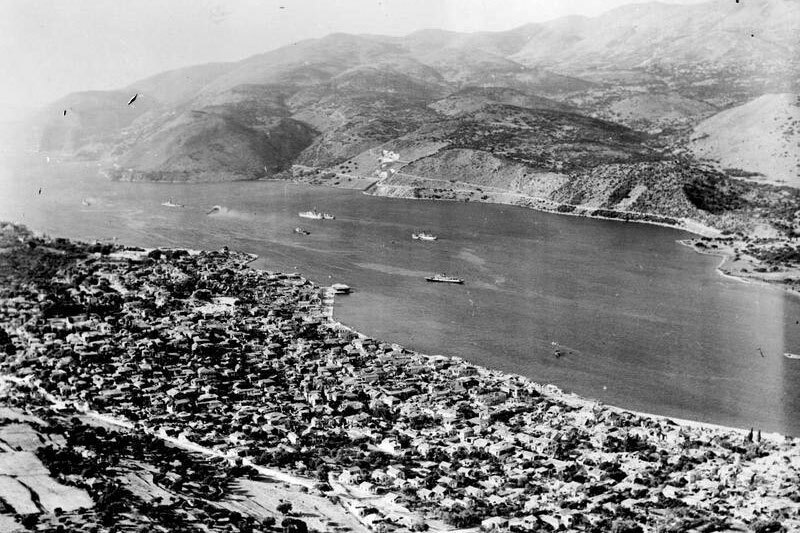 The British also dispatched their Royal Marines swiftly into the stricken area. 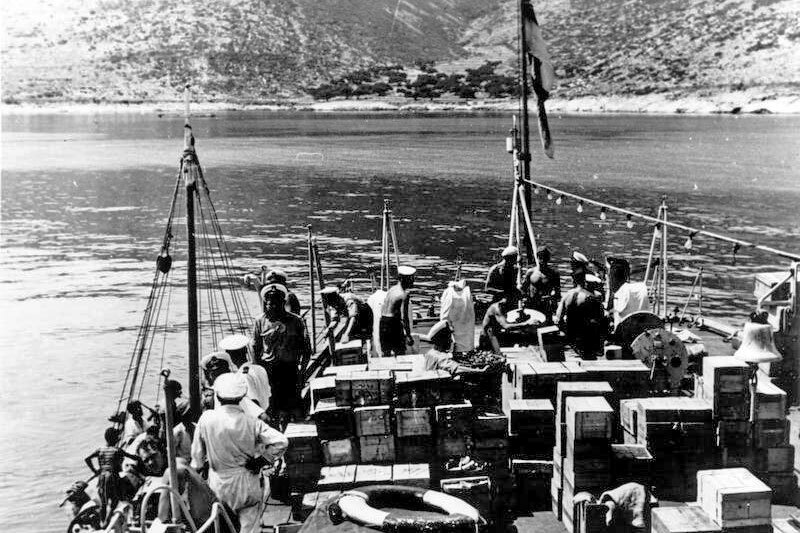 One thousand tons of food, vehicles and heavy equipment were loaded at Grand Harbor and sent streaming towards Greece at full priority. 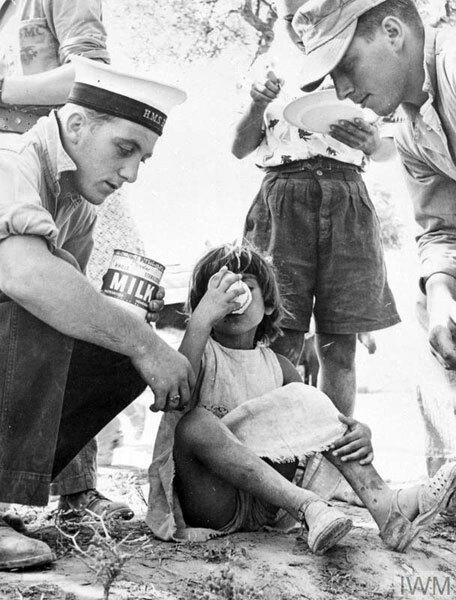 During the rescue, Marines of both nations often worked 18 hours each day feeding long queues of hungry citizens waiting for food. 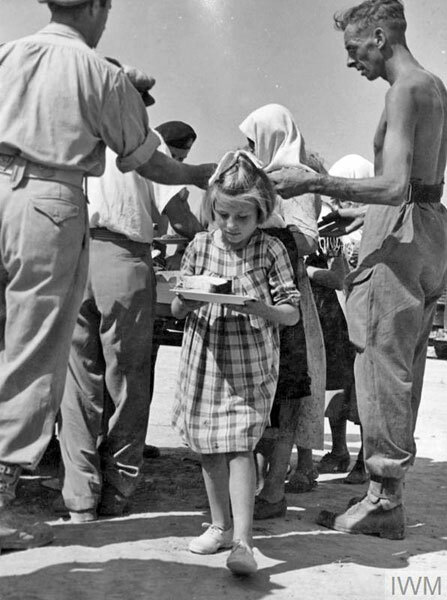 More than 18,000 meals were served, 5,000 inoculations were given and an emergency rationing system was organized. 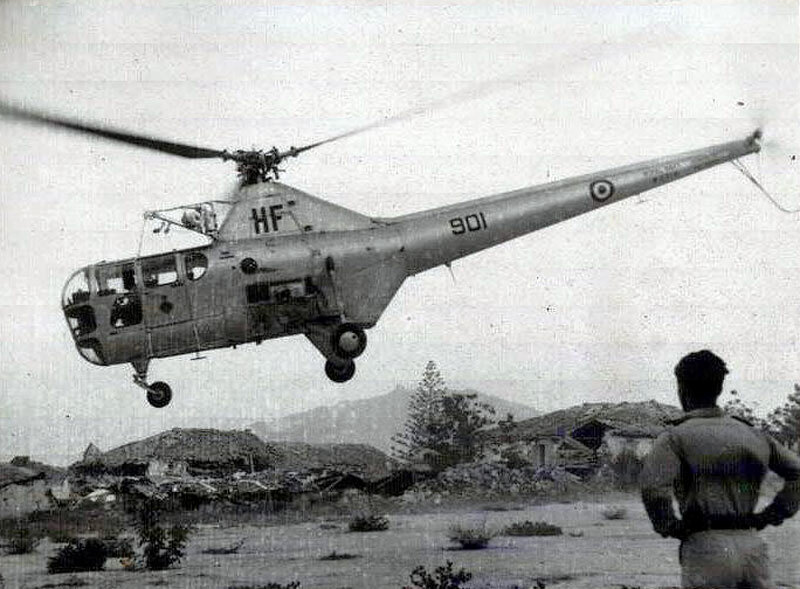 Rescue and feeding operations proceeded around the clock; many British and U.S. Marines were unable to stop for chow. U.S. Marines and Navy corpsmen formed a medical team to handle inoculations, sanitation, contamination problems and water purification. In addition, they bound up broken limbs and helped deliver three babies. 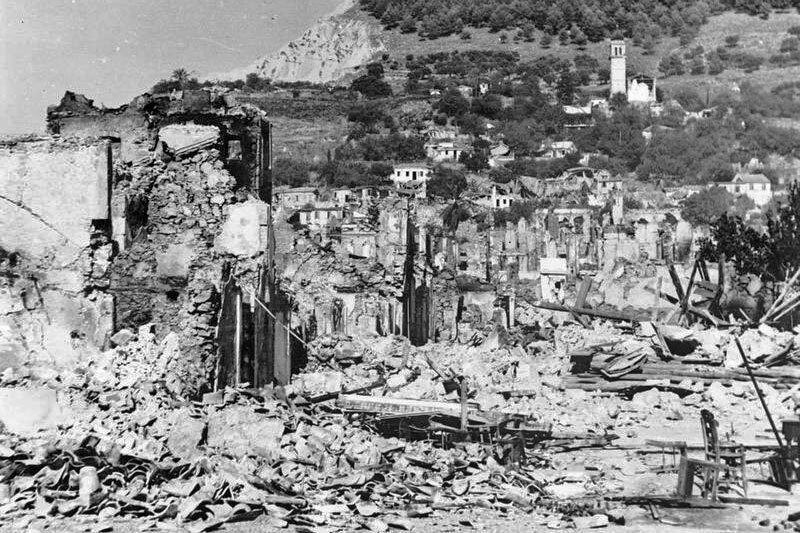 In August 1953, the 2nd Battalion, 6th Marines, under the command of Lieutenant Colonel John K. Lynch, was ordered to the Greek islands of Zante, Cepholonica and Ithaca, which had experienced severe earthquakes. They found widespread destruction and loss of life. The naval group's medical personnel and supplies, together with the Marines, divided into six separate rescue times,each team operating independently in its assigned disaster area. After administering to the dead, injured and hungry, the Marines assisted in restoring power, repairing water mains instituting sanitation measures, erecting temporary shelters, and clearing roads. The new battalion commander, Lieutenant Colonel Wilson F. Humphrey, who relieved Lynch, and the rest of his battalion demonstrated that the Marines were combat-trained and ready, but they were equally effective in providing humanitarian aid. The captain of HMS Gambia at the time was Peter William Gretton (later Vice Admiral Sir Peter William Gretton KCB, DSO & Two Bars, OBE, DSC). 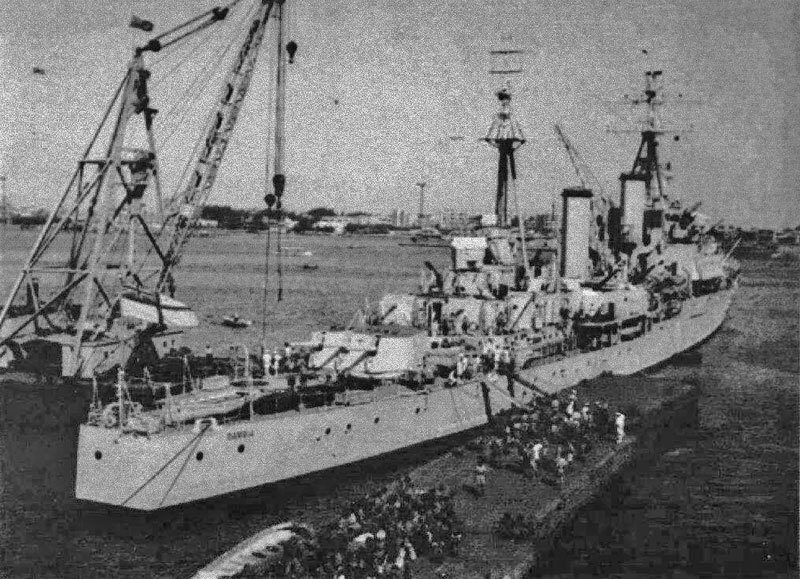 He wrote a 7-page report of Gambia's relief efforts in the November 1953 issue of The Naval Review. I have extracted the fascinating report from it and that is available separately here. 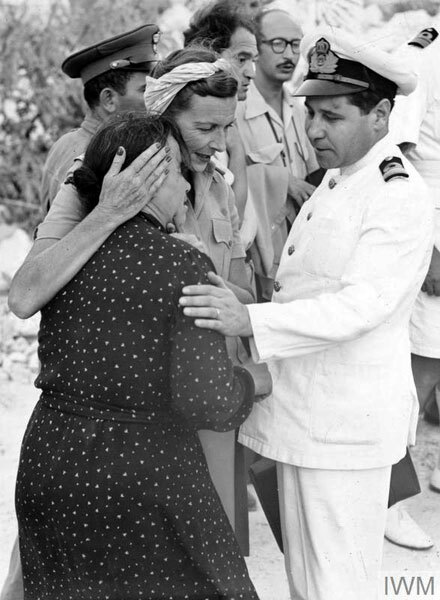 The London Gazette of 16 February, 1954 reported that to Chief Petty Officer Stoker Mechanic Thomas Burns and Chief Petty Officer William Leonard Prosser "The Queen has been graciously pleased to approve the award of the British Empire Medal (Military Division) for distinguished service in the Greek earthquake relief operations in August, 1953" to them. 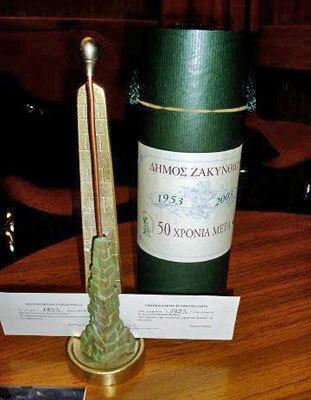 To mark the 50th anniversary of the earthquake on the Greek island of Zakynthos, the Mayor invited the Athens Embassies of those who had provided humanitarian aid to a weekend of commemorations. 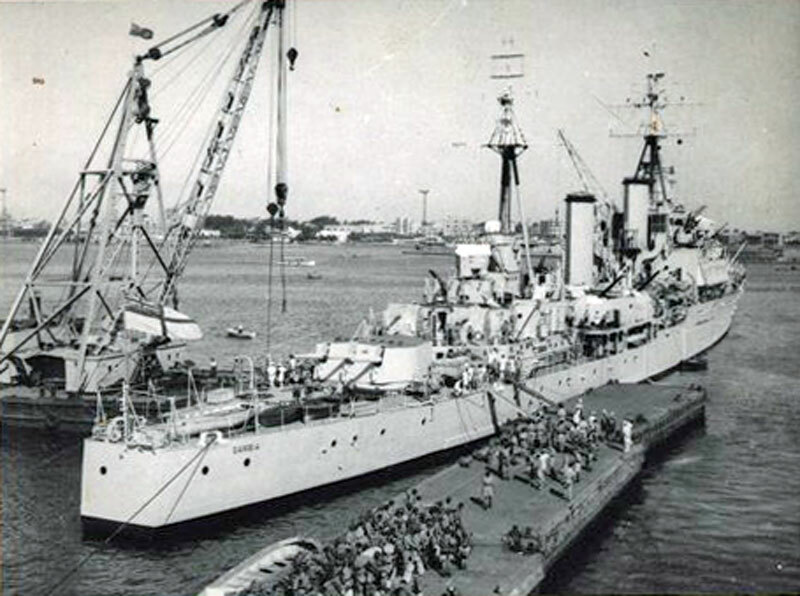 Through Navy News reunions column the British Naval Attache Capt John Wills was able to contact the Association of an RN warship that had taken part in the relief operation, HMS Gambia. And within a few days it was arranged for the World War II cruiser and the Royal Navy to be represented by the Secretary of the HMS Gambia Association, Les Newman. Les had been a young regular sailor on board at the time of the disaster and this was his first visit back to Zakynthos ( also known as Zante). "The most rewarding aspect of the whole weekend was the opportunity to talk to the earthquake survivors and their families, of which there were plenty," Les told Navy News. "I was particularly pleased to have the chance of a long chat with the curator of a private museum dedicated to the earthquake. 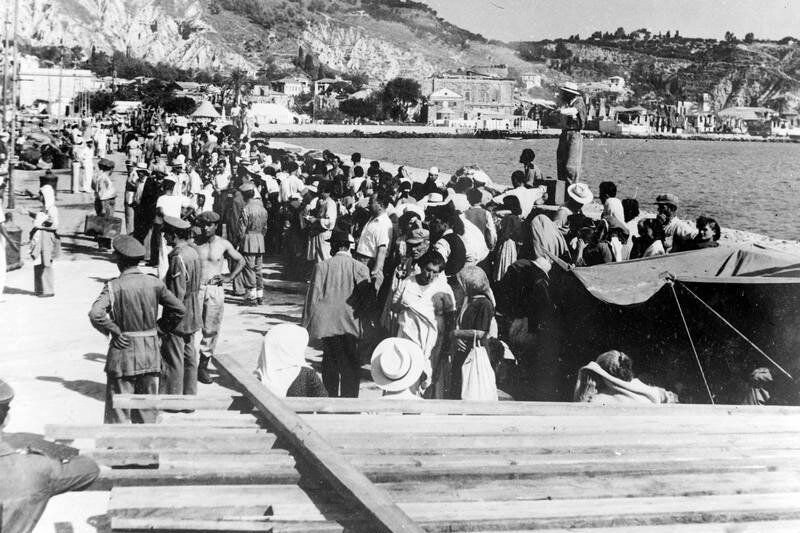 "Despite obvious language difficulties, the warm reception and genuine gratitude displayed by the local Greek people meant a great deal. 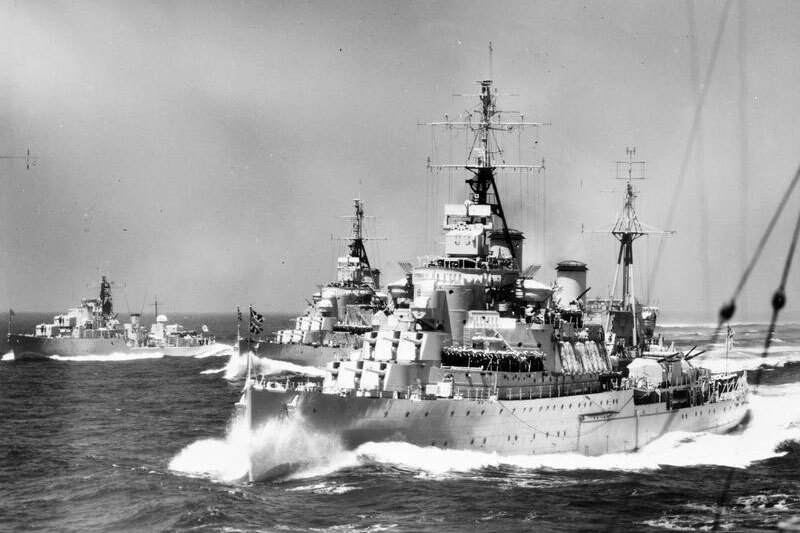 "I am particularly proud of HMS Gambia's achievements at the time of the disaster and the memorial weekend served to reinforce the strong ties between the ship and the island." The weekend featured a number of exhibitions and services, including the unveiling of a memorial to the victims - of which Les received a miniature copy. 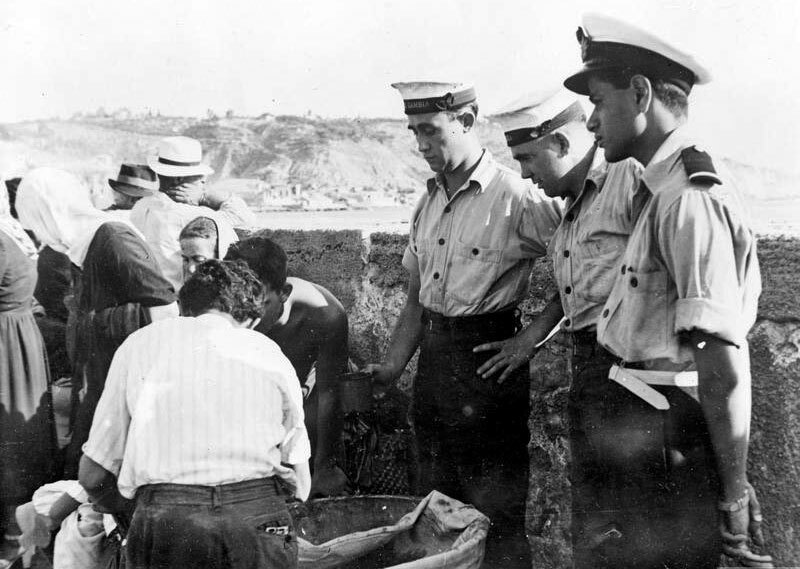 On the day of the earthquake, August 12, 1953, HMS Gambia was returning to Malta from a tour of duty in the Suez Canal. Signals were received from CinC Mediterranean instructing the ship to sail to Zakynthos and provide emergency disaster relief. The island was sighted at 0700 hrs the following morning - the town itself hardly discernible through a thick haze of smoke which hung like a shroud over the still and silent streets. Zakynthos had been on fire since the earthquake and was still a blazing mass when Gambia arrived. 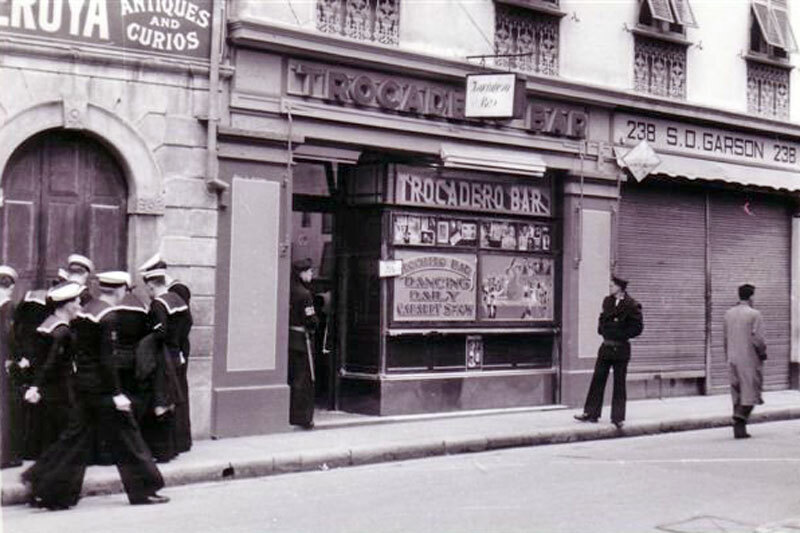 First ashore were the Royal Marines and two platoons of seamen, who landed with the objective of clearing a road through the town to enable casualties and supplies to be moved. The work of all parties was made extremely dangerous by the presence of hand grenades which were stored in practically every house and used by local fishermen to stun fish! These exploded continuously in the heat of the fires. From time to time earth tremors still shook the ground and could even be felt on board ship, as if depth charges were being exploded in the sea. 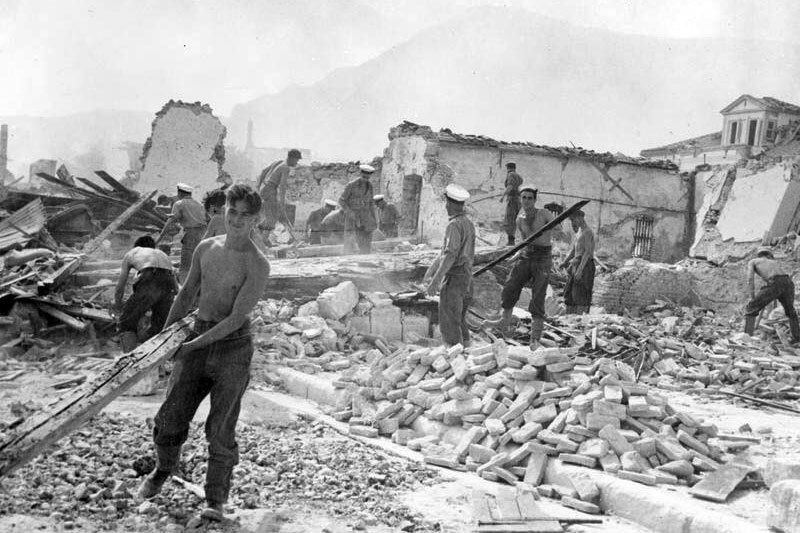 Each tremor brought fresh destruction to the area, piling debris upon debris until most of the narrow streets were buried to the height of 10ft with fallen bricks and shattered timber. 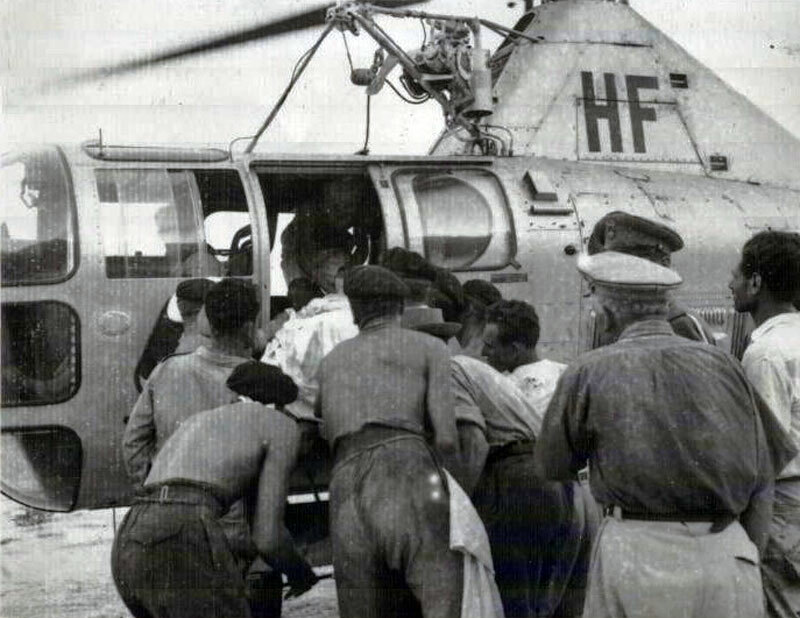 By late afternoon, the landing party had succeeded in cutting and blasting a road through to the south of the town and casualties could be taken to the temporary hospitals for treatment. 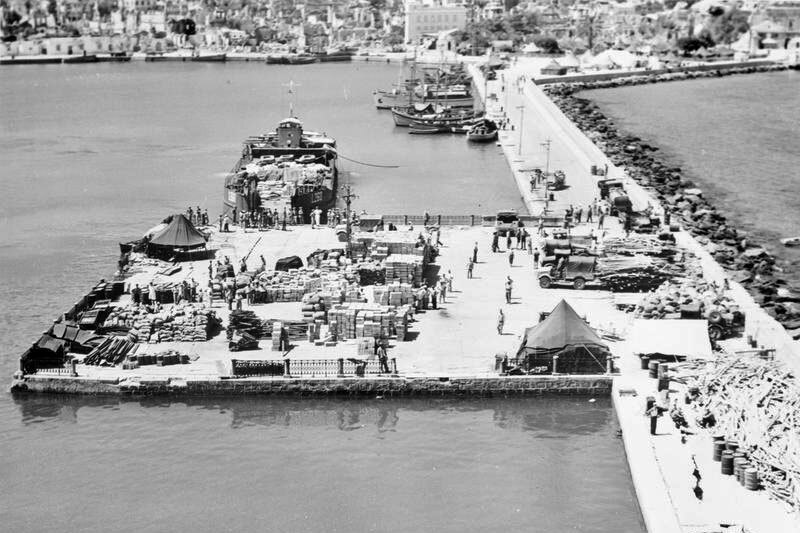 On August 15 an American landing craft and HMS Bermuda arrived from Malta loaded with jeeps, helicopters and large amounts of medical supplies and food. To HMS Gambia this was a welcome sight, as she had been coping with the aftermath of the disaster almost single-handedly over the previous two days. 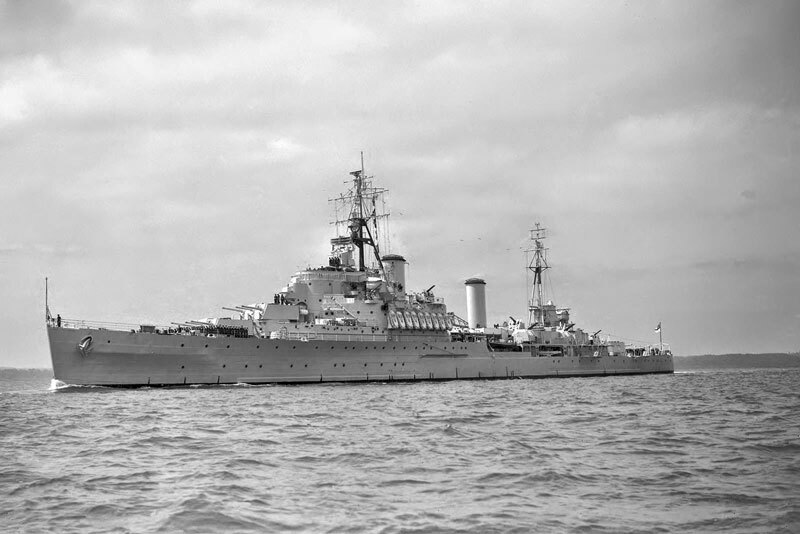 Remainder of the day was spent in turning the job over to HMS Bermuda and landing fresh equipment and stores. Amongst the new arrivals were many bell tents which were soon erected to form small villages to house the homeless population. Even more welcome were the large field kitchens needed to cope with the feeding arrangements. 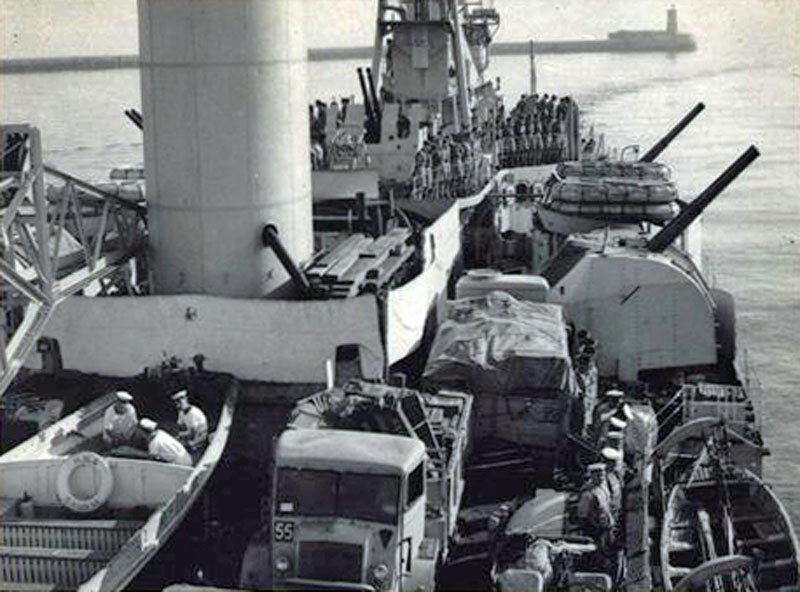 Early on August 16, HMS Gambia began to withdraw her equipment and rescue squads. Most of the sailors were asleep on their feet, having preferred to carry on the rescue work throughout the night. 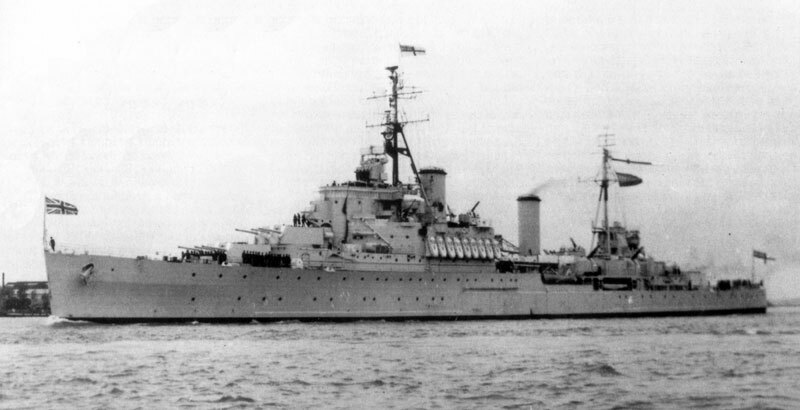 At 1200hrs the cruiser sailed for Malta and received a message from the MP for Zante: "Having just come back from Zante and having worked side-by-side with the CO and ship's company of HMS Gambia, I would like to commend them for their gallantry and services rendered beyond the call of duty. 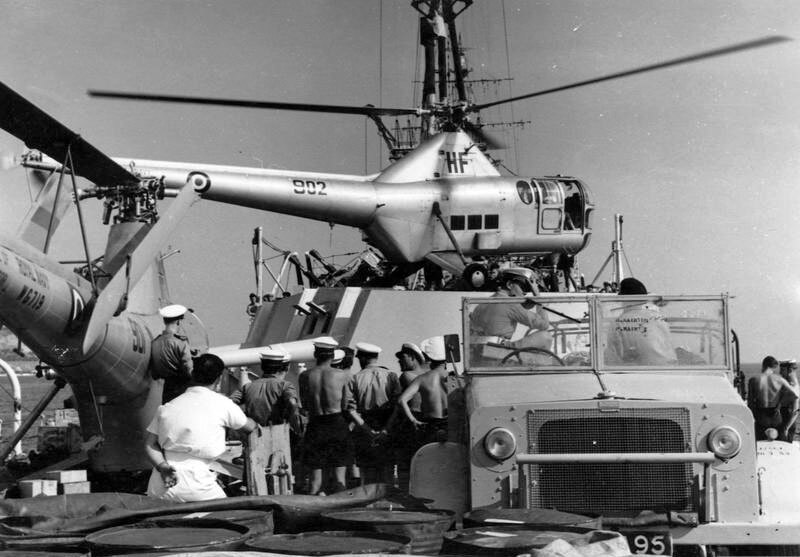 "We Greeks have a long-standing tradition with the Royal Navy and it lived up to every expectation in its infallible tradition of always being the first to help. 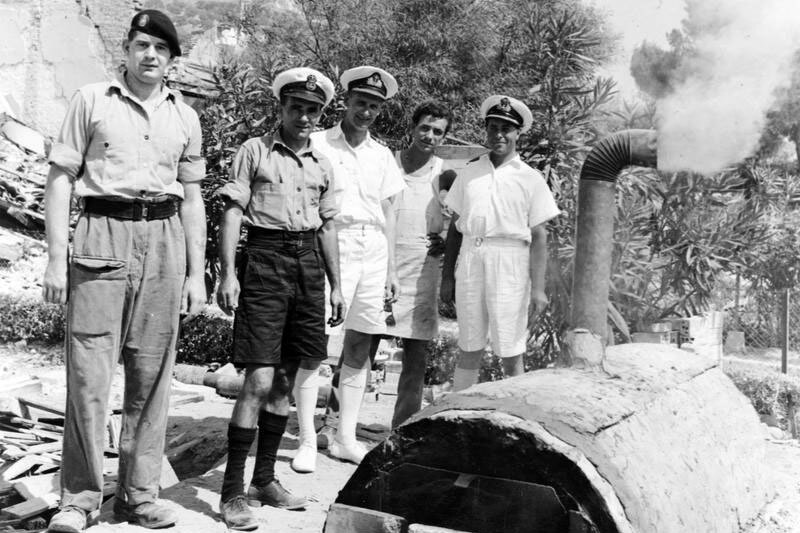 "The high degree of discipline and training of HMS Gambia's complement produced magnificent results, felt all through the island of Zante. "May I also convey to you as the Head of Her Britannic Majesty's Naval Mission here our heartfelt gratitude." The people of Zante are very grateful to the Royal Navy for the assistance given to them immediately after the earthquake. Frank Crompton was on HMS Bermuda and in October 2017, now aged 81, described going back for the earthquake's 60th memorial. 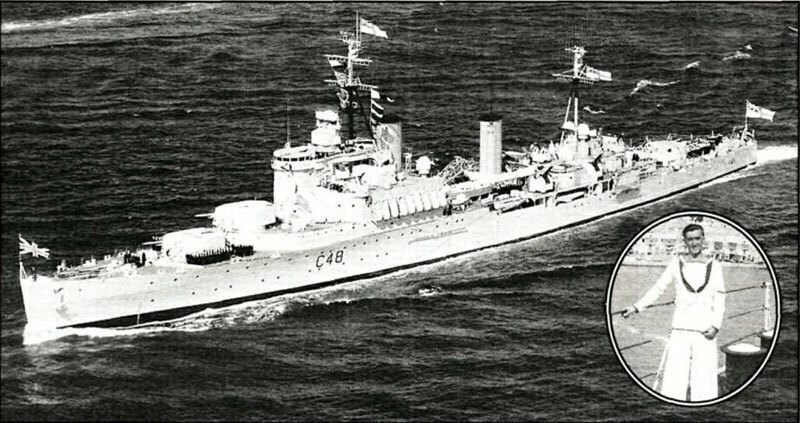 I served on HMS Bermuda and 3 years ago I was traced by the Greek government of Zante I was invited as guest of honour for the 60th anniversary of the great earthquake in 1953 and for the help I did they gave me the highest award they could and I made a speech at the award ceremony. I don't think they could find anyone else as I was one of the youngest on HMS Bermuda as we where the first to the rescue at the earthquake, I was treated like a film star for the two weeks I was there, I was interviewed for TV and the radio plus in all the papers on Zante, I remember how bad it was over 800 people died and only 3 houses where left standing it was a great honor to be given this award and I said it was for all on HMS Bermuda. Frank also emailed me to say that while at the 60th anniversary of the earthquake in Zante he was made a Honorable Zakynthian Citizen and presented with a brass plaque and a carved stone medallion. 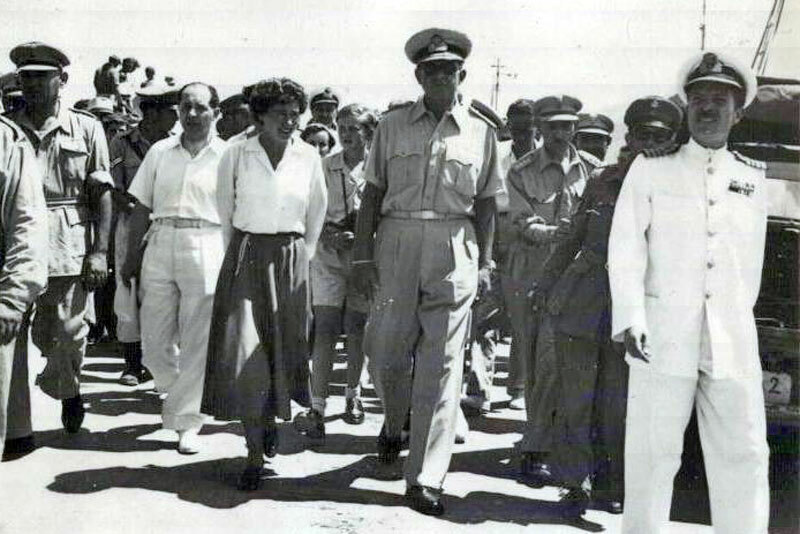 Friday, August 13, 1954, an ominous date, found us on our way to Port Said to evacuate The 40th Brigade of the R.M. Commando from the Canal Zone. We arrived on August 16 in company with H.M.S. Glasgow and secured in the Canal whilst she went alongside Navy House and embarked her passengers. On Tuesday, we took her place and before long the upper deck resembled a cross-channel car ferry as a long succession of lorries, jeeps, water trucks, and utilicons were hoisted inboard and secured in unbelievable places. At 1600 we embarked the brigade and at 1700 we sailed once more for Malta. 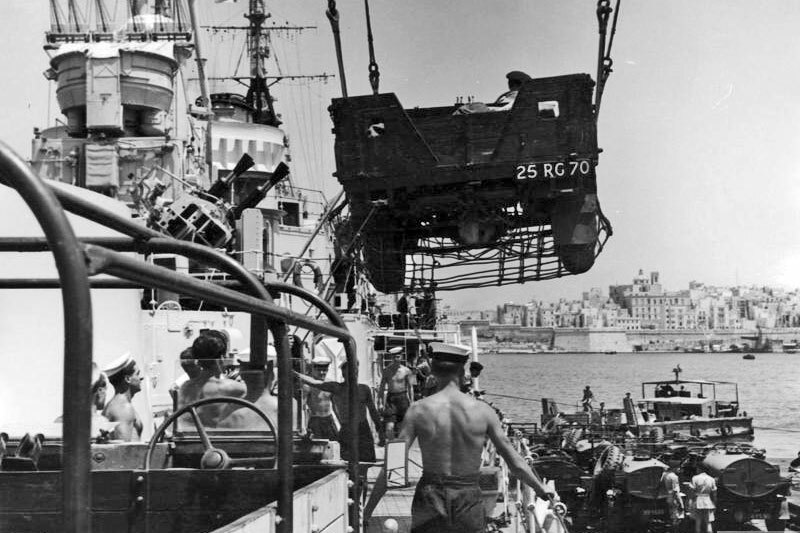 We arrived safely in Malta on August 20 and disembarked our strange cargo, before securing to our billet once more. These images were on the original HMS Gambia Association website and were submitted by various people. I think I have now managed to attribute them properly. It seems there were two photo-journalists on Gibraltar during 1953/54, they were Ralph Crane of Life Magazine and Bert Hardy of Picture Post. 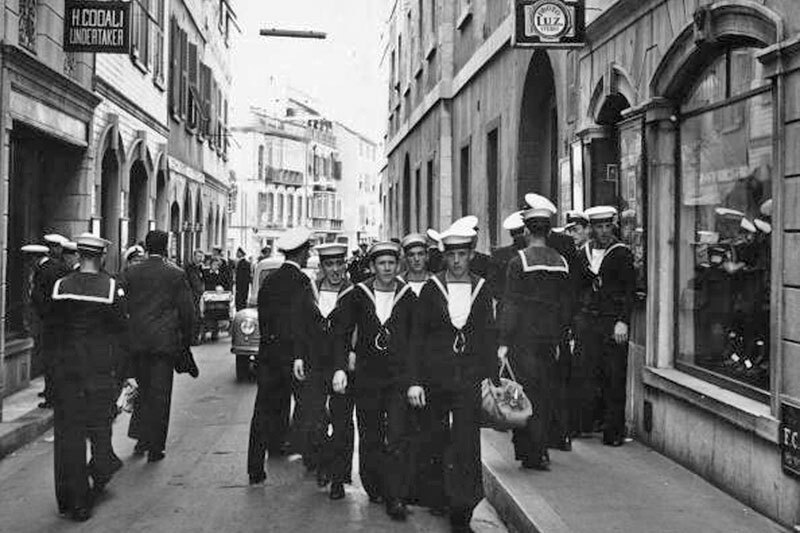 There's copies of these and other great pictures of Gibraltar in the 1950s on the Gibraltar Blogpsot pages, here, here and here.